Actually, this was complete months ago, but I just realized I haven’t posted anything on here in a long while. 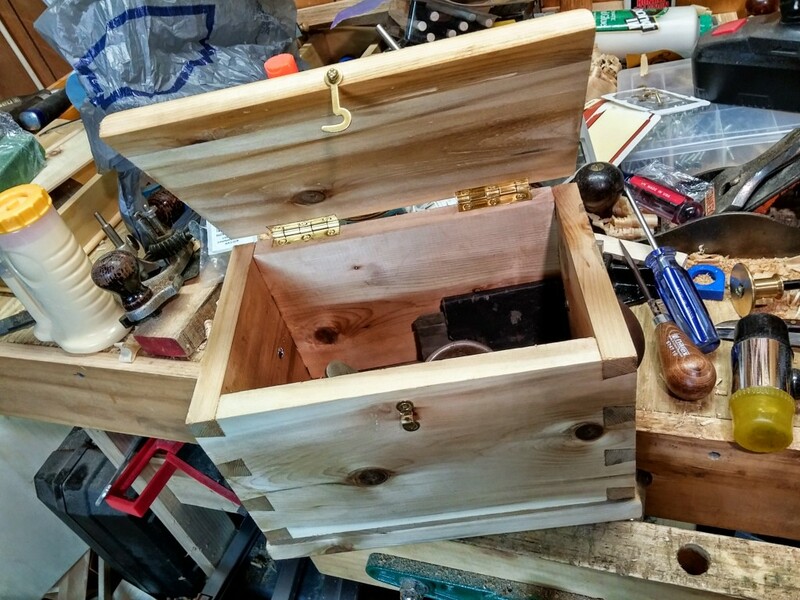 Anyway, to follow up with my last post, here are some photos of the finished box. It came out quite well. Really happy with it. 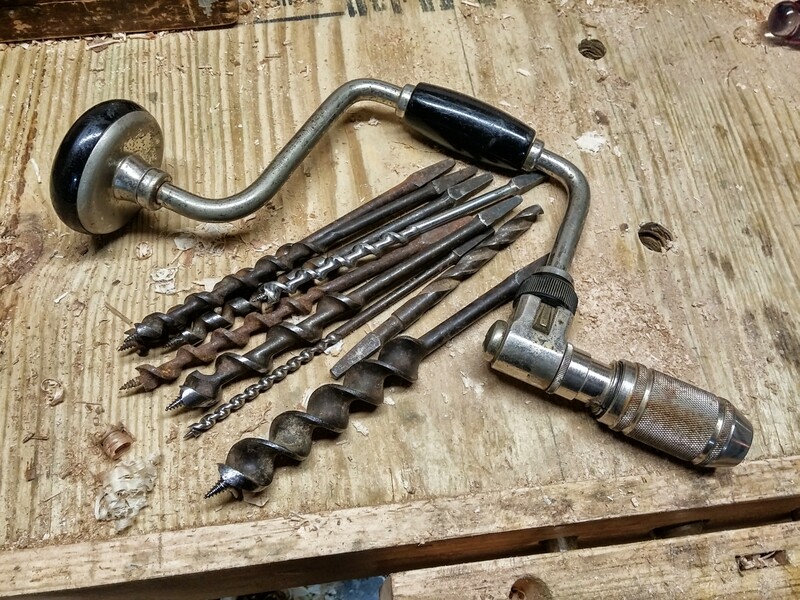 A while back I got myself a vintage brace as part of my hand tool collection. It came with an assortment of random bits, but these turned out to be four 1/2″ bits, a couple of 3/4″ and a few others. Not much of an assortment really. So a more recent purchase was this box of vintage bits. 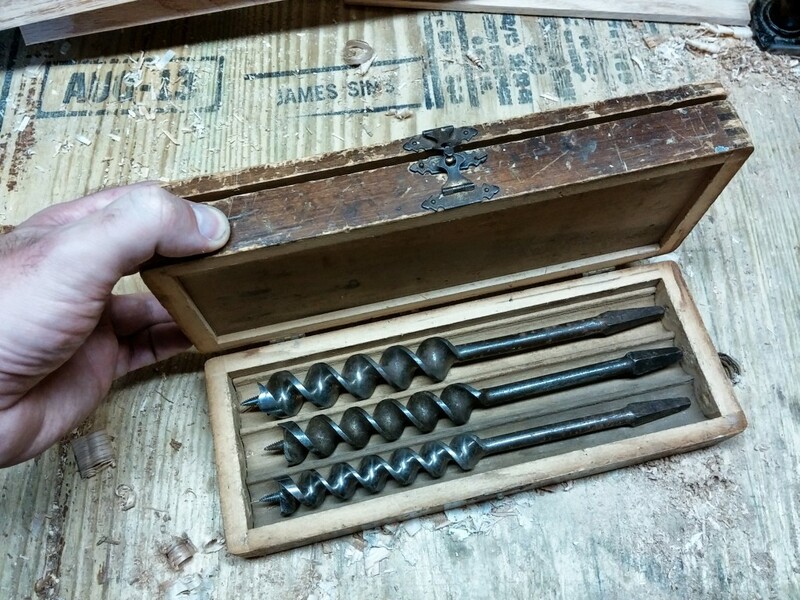 These came in this nice wooden box, though it wasn’t in the greatest condition. Auger bits like this come in sizes usually ranging from #4 to #16. The number is actually a multiple 1/16″, so a #4 is a 1/4″ bit, #5 is 5/16″, #6 is 3/8″ and so on up to #16 which is 1″. 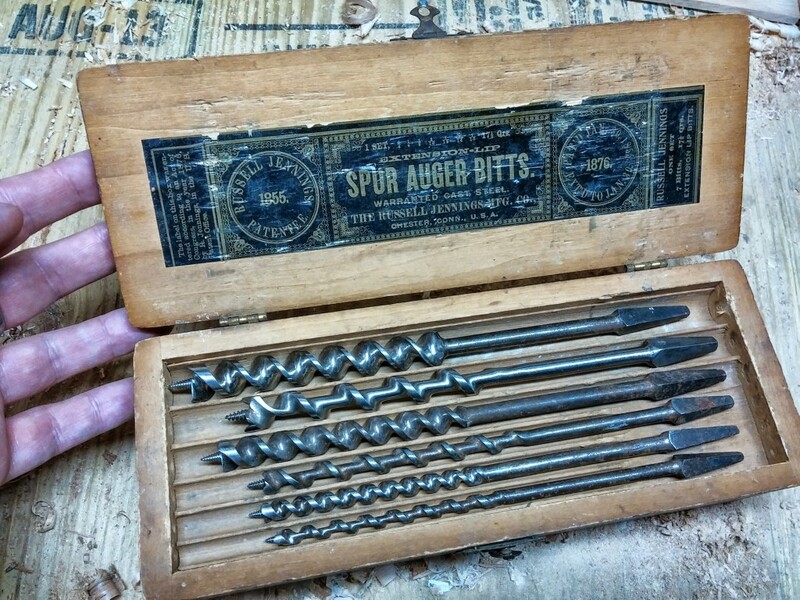 This set originally contained seven bits in even sizes: #4, 6, 8, 10, 12, 14 and 16. But as sold, this had two #4s, a #5, 8, 10, 12, 14, 16. Since then I’ve been filling in the gaps with a #6 and #9 so far, with a #11 on the way. But a full set of 13 will be too big to fit in the box, which, while pretty cool, is not too sturdy anyway. 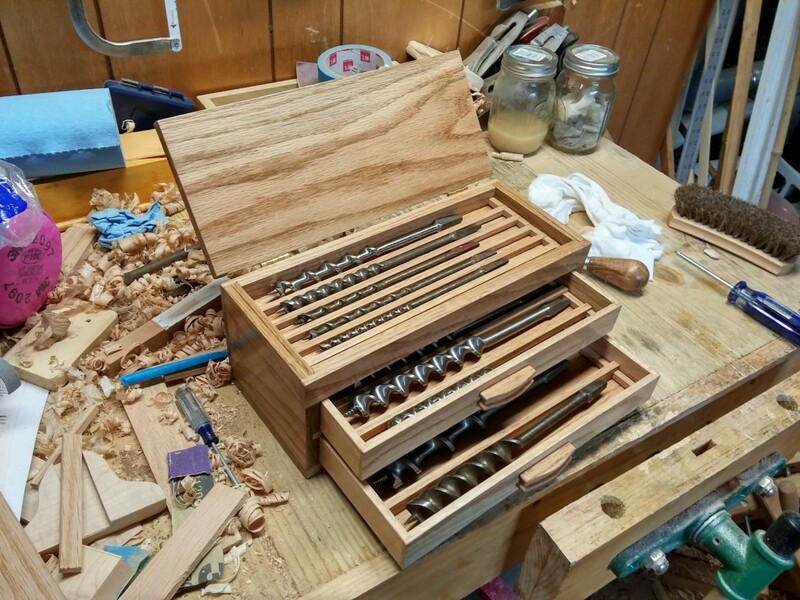 So… time to make a new box! I first did a ton of planning on this, working out the whole thing in Sketchup. 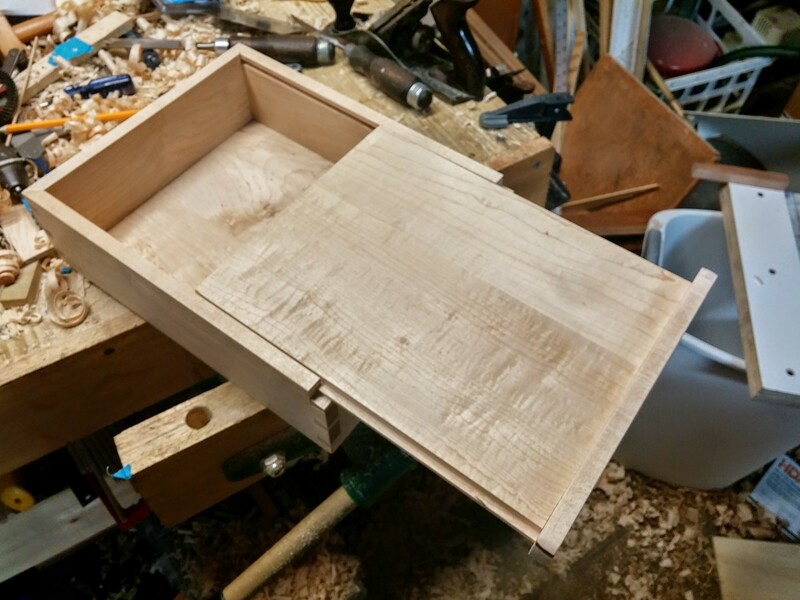 I decided to have a hinged top, covering a top tray that will hold the six smallest bits, from #4 to #9. 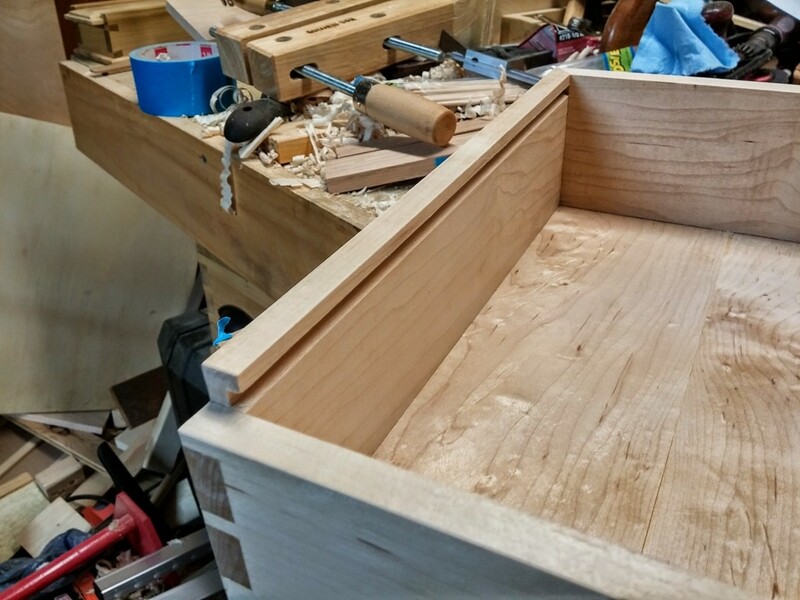 Then a middle drawer holding #10 – #13 and a bottom drawer for #14 – #16. I got pretty thorough with the drawings. And with the top open and drawers out. And an exploded view showing all the parts. But these drawing were just for rough planning. I needed to know exact sizes. So this last drawing is a 2D plane showing all the bits’ diameters, and how they will fit in each compartment, so I could get overall dimensions. 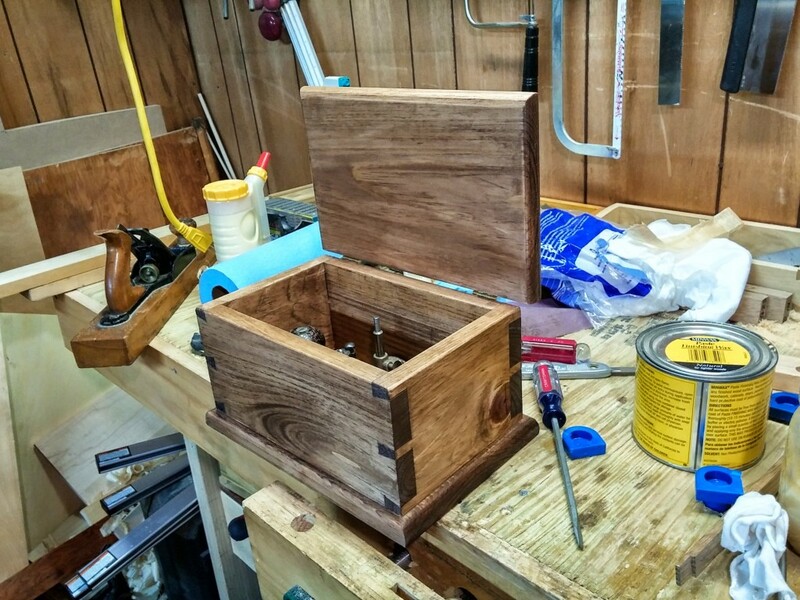 With that all worked out, I got to work on the main box. This is all going to be in red oak, pretty sturdy stuff. 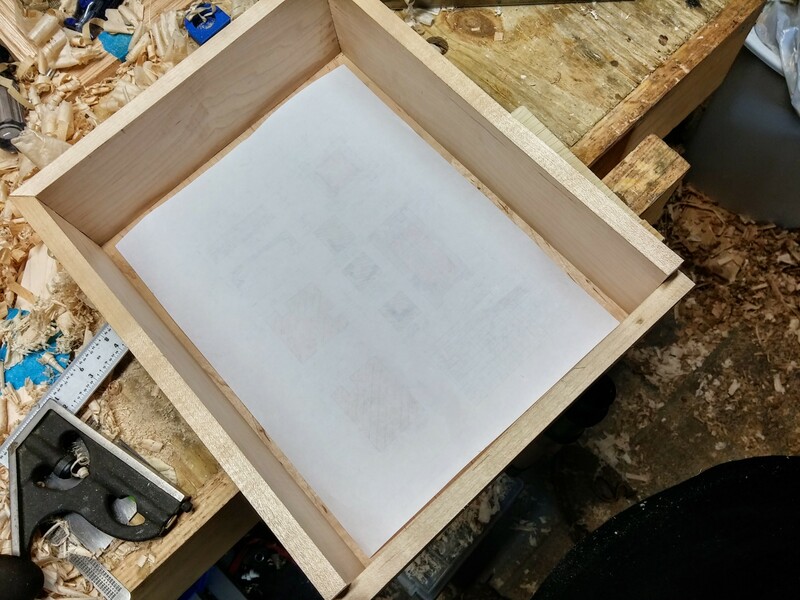 1/2″ boards for the main box, and 1/4″ for the bottom of the top tray and to separate the drawers. 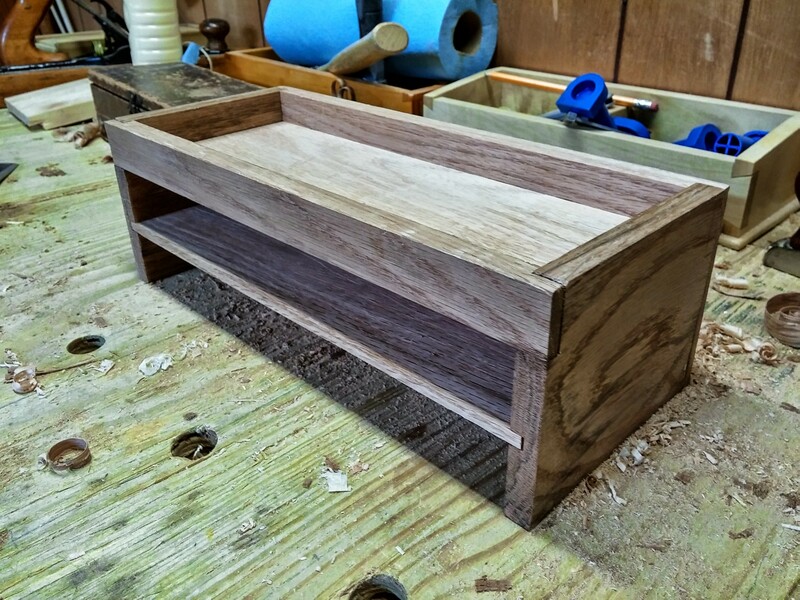 Also, the drawers will be all 1/4″ construction. Here are all the pieces laid out. And a detailed shot of some of the cuts. These were fairly complicated pieces. Lots of grooves and rabbets. 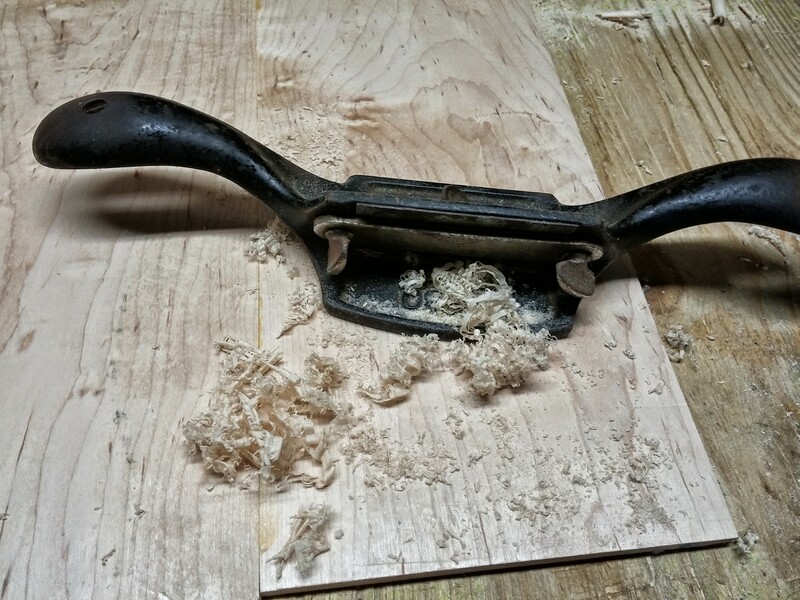 Lots of chances to use my favorite tool – the Record 044 Plough Plane! I like that where the grooves meet the rabbet, it makes it look like two layers of wood, with some smaller pieces sitting on a larger one. But that’s all one chunk of wood cut into shape. 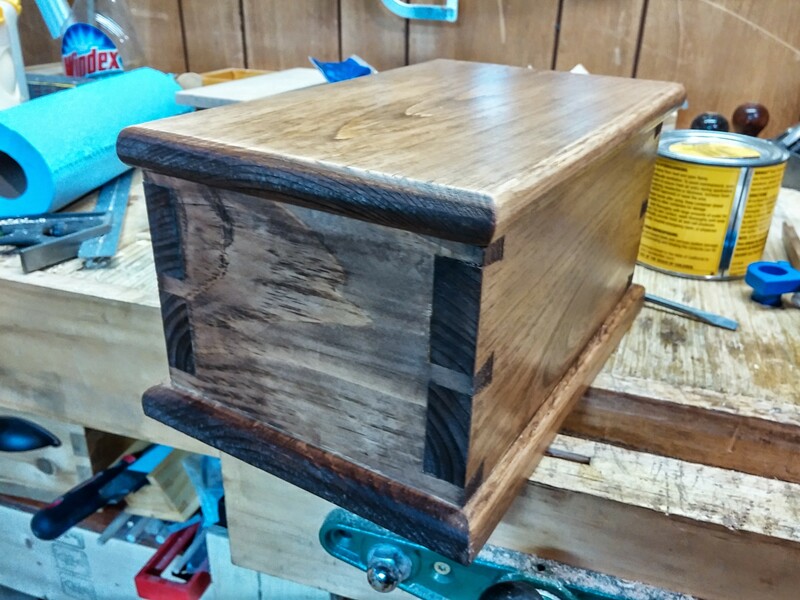 This is all done with 100% hand tools, of course. No electrical anything but the basement lights. And here’s a dry test fit. Looking good. I was surprised how quickly all this went together. And finally, the glue up. Have we got clamps? Yeah, we got clamps! 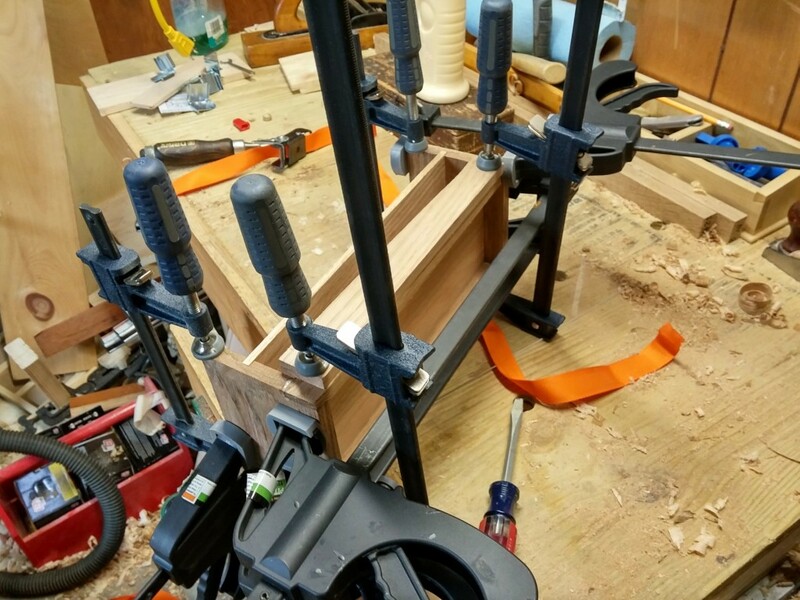 Enough clamps? Never! Tomorrow I’ll prepare the top and bottom and glue the bottom on. 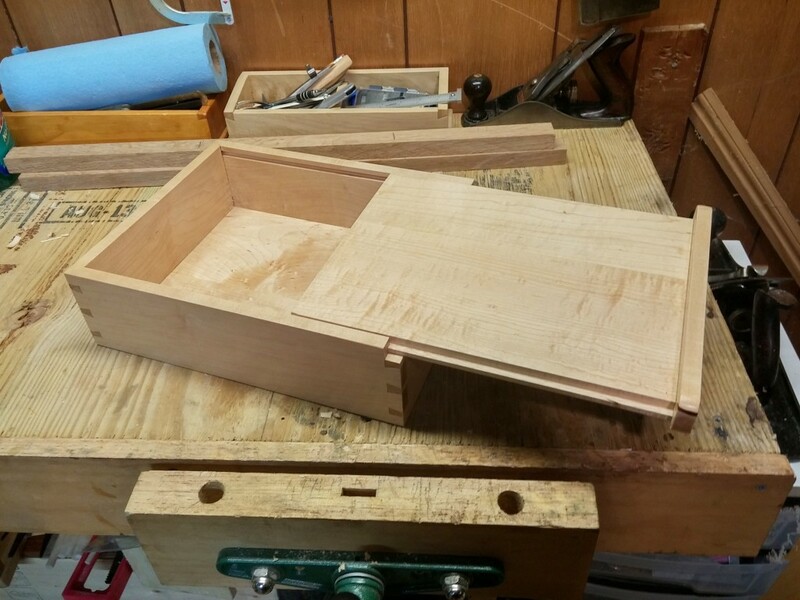 The top will be hinged, so that will come later. I’m not totally sure on the mechanical strength of all these joints, so I’ll probably throw in some small nails here and there for insurance, though I think it’s probably fine. 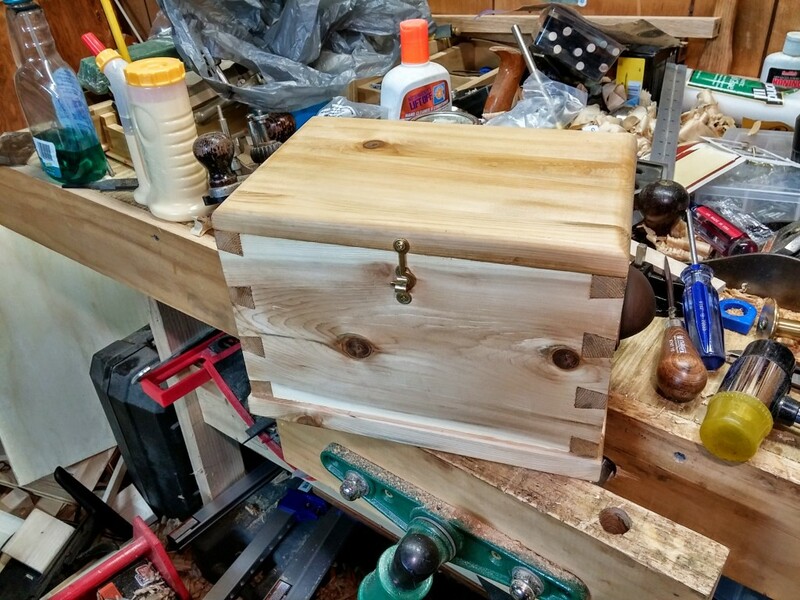 Yes, another dovetailed box. 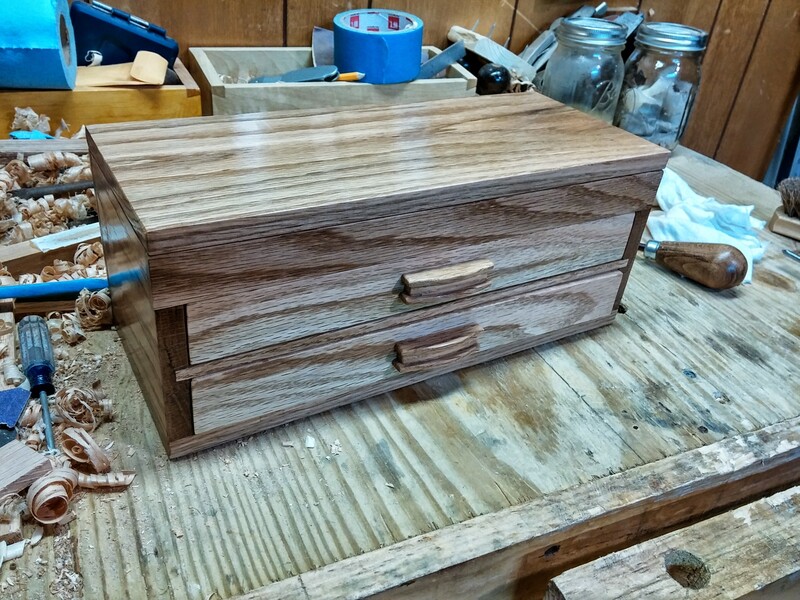 I do like making these, and I’m actually starting to get pretty good at the dovetails. Everyone says it’s just practice. I guess so. I banged these ones out pretty quickly, gang cutting the tails. This means I put the two front and back boards together and cut the tails on both of them at the same time. This is not only quicker, but the added width helps you to cut straight. Including layout, the tails took about a half hour to cut and chop out. The pins took a bit longer. It’s always a more delicate operation because you are now matching a second set of cuts precisely to the first set. And they have to be done one at a time. And due to poor planning, one of those pins was smack in the middle of a big knot. I wound up breaking a big chunk out of that knot while I was chopping out the waste. But it’s inside so you can’t see it. 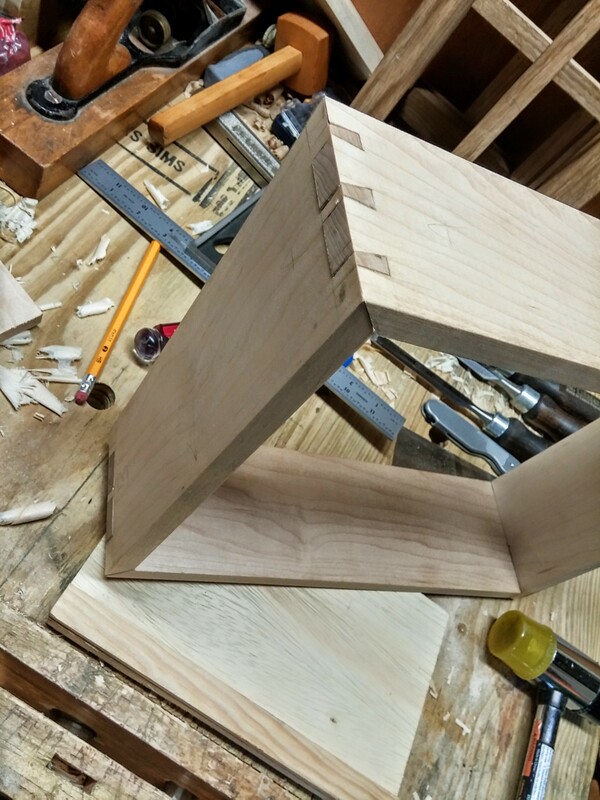 Other than the knot incident, these dovetails came out as close to perfect as any I’ve done yet. Only one small gap in the whole bunch of them. I guess the fact that it was pine helps. This stuff is like cutting and planing butter. The top and bottom went very quickly. Not much to them. Just a couple of boards with some roundovers. I was using a nice wide pine board, so there was no need to glue up panels, just cut the top and bottom to size. When all that was done, I decided to try a bit of stain. 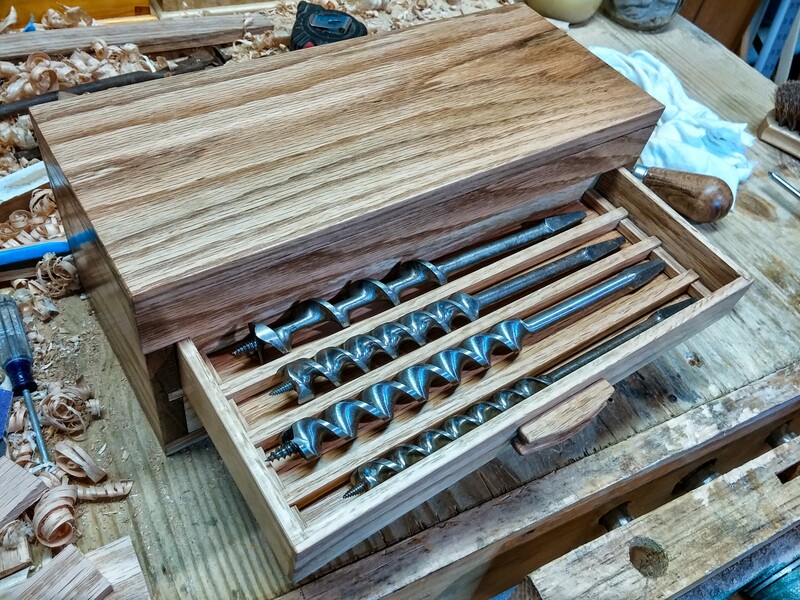 This is just a shop project to hold a tool – a Stanley 71 router plane with accessories – so it was a good piece to experiment on. Wiped on the stain, it sucked right in. Let it sit most of a day, then wiped it down and applied three coats of shellac and some wax. I was surprised how good the stain made the cheap home center pine board look. It’s a cherry stain, and almost looks like cherry. The illusion is destroyed when you pick up the box though. It’s way too light. The whole project took no more than a few hours total. The build was accomplished over the weekend, but I was out most of the weekend doing other family stuff, so was only able to put in a half hour here and there. I did the stain Monday morning and the rest of the finishing Monday night. 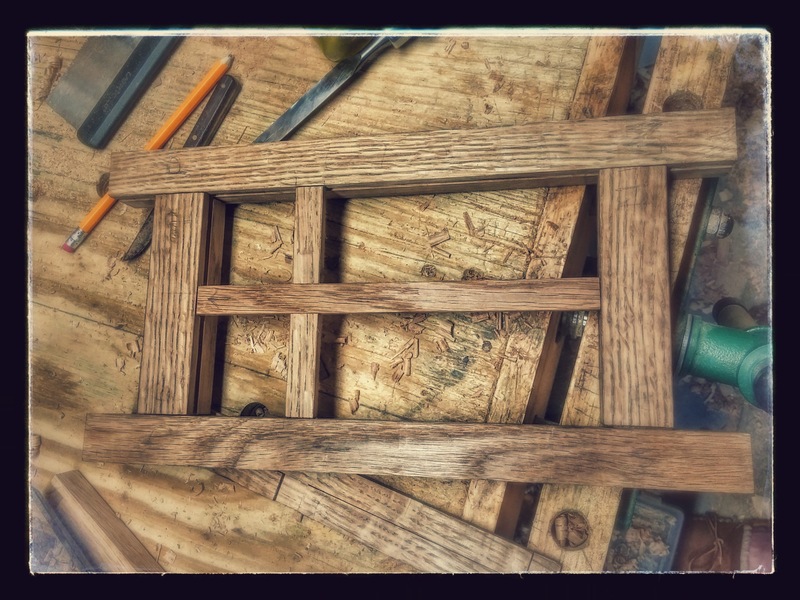 As usual, this was done with 100% hand tools. The only electricity used was for the shop lights so I could see what I was doing. 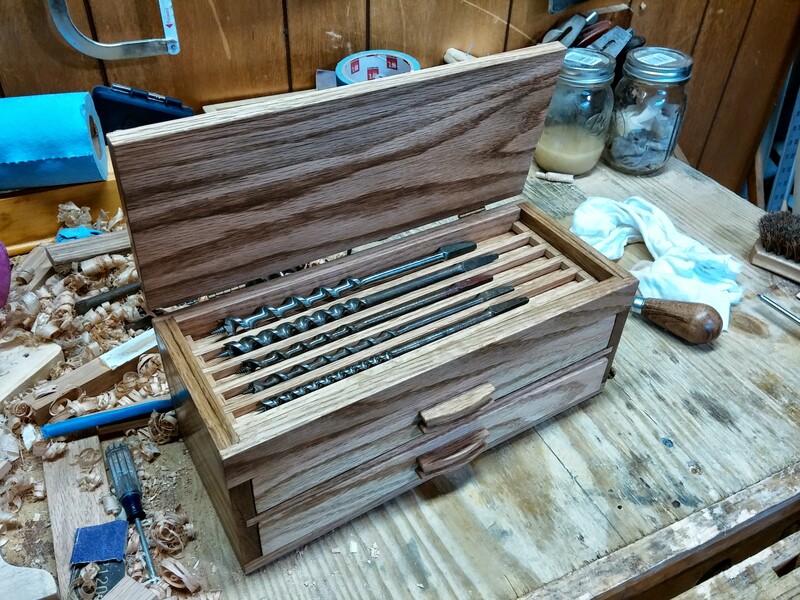 So another fine shop box project. This one was a quicky and feels pretty cheap when you pick it up, but it will still probably last a few decades longer than I do. I always imagine where these things will end up in the far future. In someone else’s shop as a proud possession, still holding the tool I made it for? Repurposed for something else, and still in use? In a basement or shed somewhere, under a pile of other old junk? Even the last one would be OK, kind of like a time capsule, waiting for some kid to come along and find and clean up and use to store some precious toys. The only bad option would be to have it wind up in an incinerator or landfill somewhere. I’ll never know, I guess. That’s part of the fun. Next came the bottom. 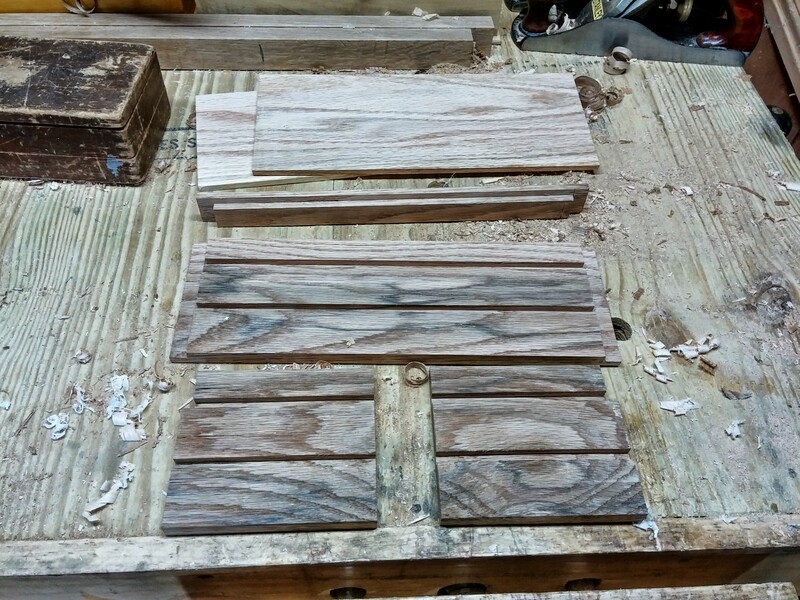 This is a glued up 1/4″ maple panel. Damn near impossible to plane this stuff. The grain is all over the place. Had to resort to a cabinet scraper for some of it. 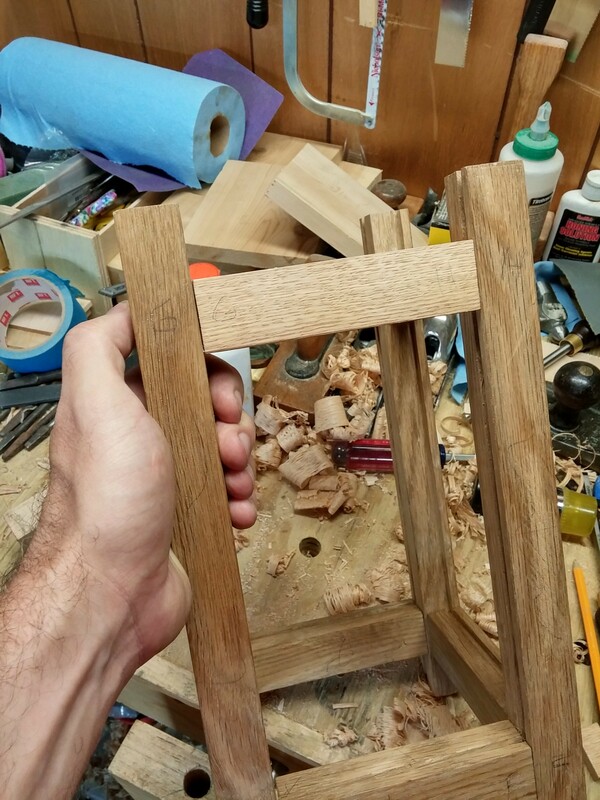 Eventually got it fitting nicely in that 1/4″ groove in the bottom of the frame. Smoothed it all out with a card scraper. Again, this was sized to fit an 8 1/2″ x 11″ stack of paper. 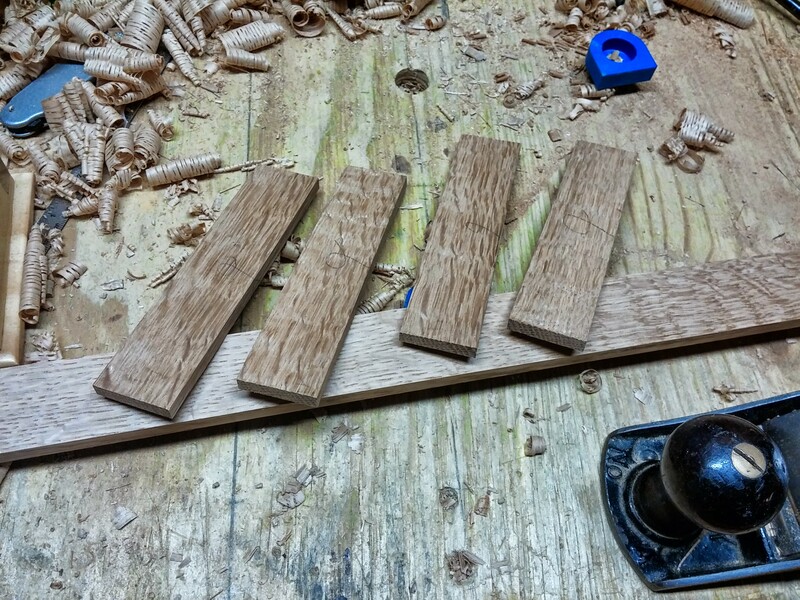 I then cut grooves in the tops of the two side pieces for the top. 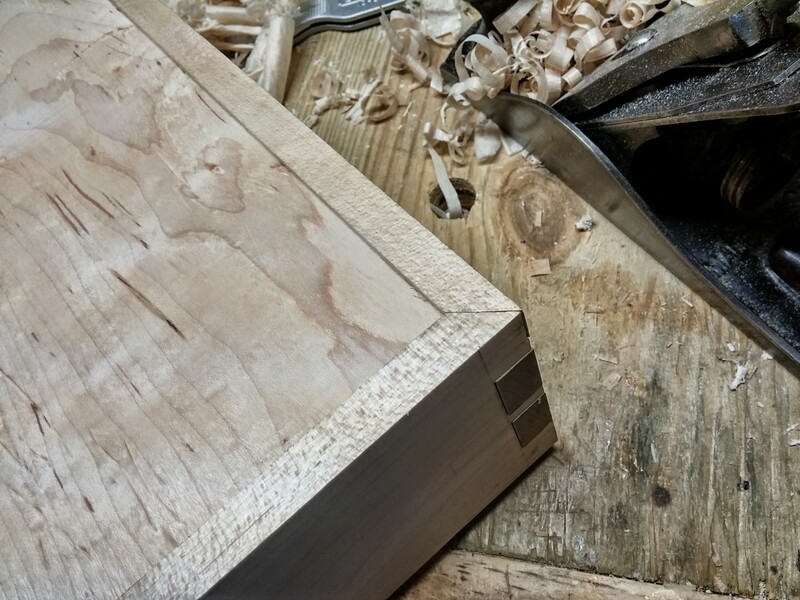 The top is 1/2″ thick with a 1/4″ rabbet, so it slides right into those grooves. The front handle is another piece of maple, rounded over, and attached with glue and a few dowels. 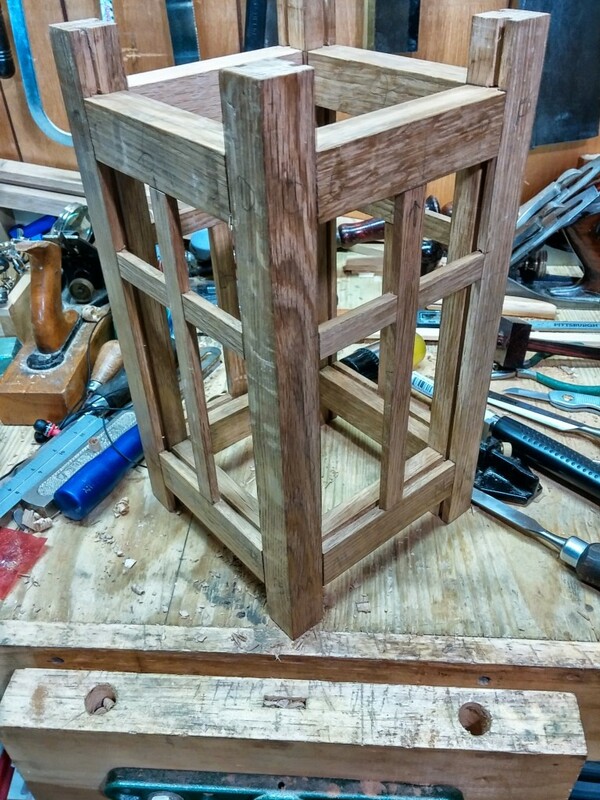 And finally, all glued up. Three coats of shellac and polished with wax. The maple has some really nice figure. I’m happy with the way this turned out. 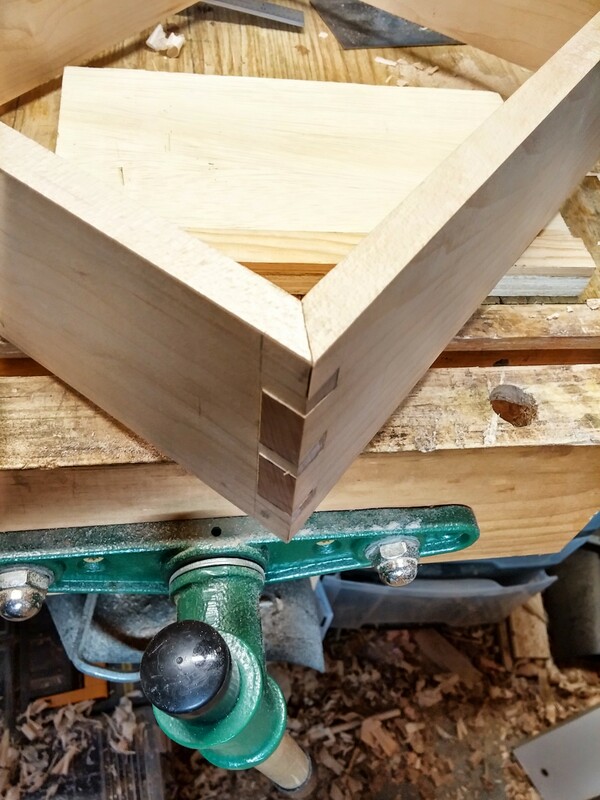 A few gaps in the dovetails which I didn’t even try to fill. This thing is solid and will last 100 years easily if it’s not completely abused. I love knowing that. I have no use for this box. 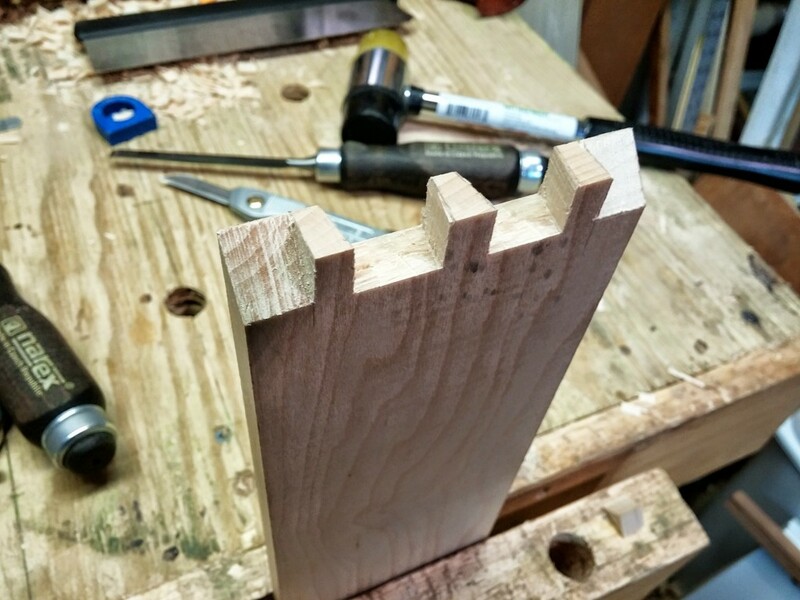 I mainly made it to try my hand at the mitered dovetails which wound up going really well. For sale, best offer. I haven’t put much time into this recently, but did put in a half hour here and there over the last few days. 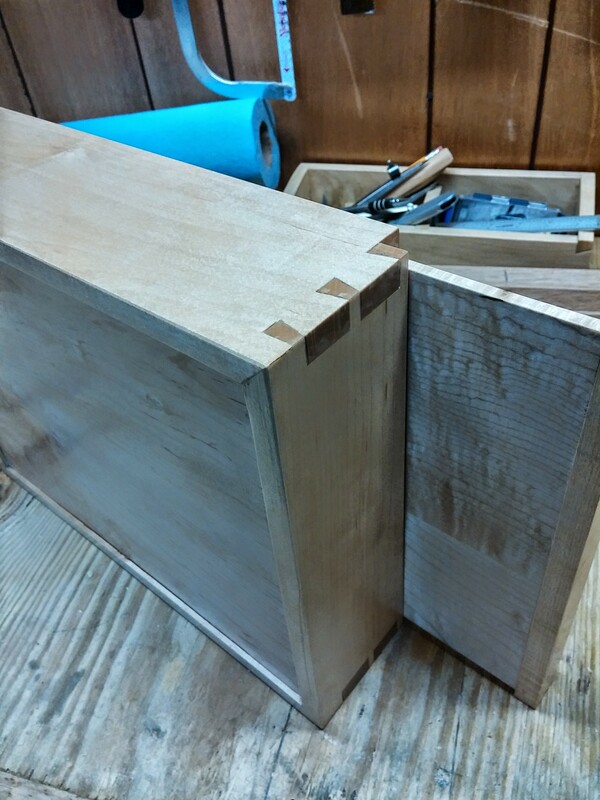 I got the rest of the mitered dovetails cut. Actually, I screwed one of them up completely, cutting straight through where I was supposed to cut at a 45 degree angle. So I had to replace that piece. Other than that, though, it all went really well. 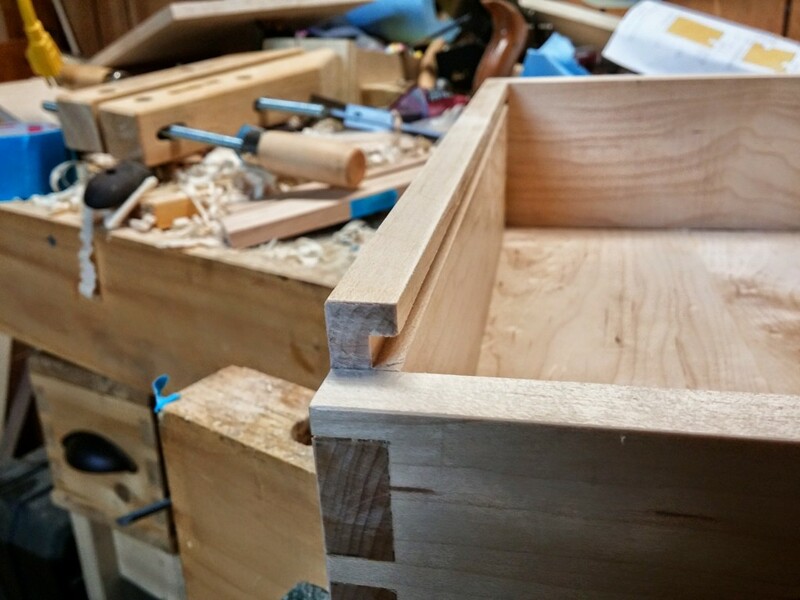 I daresay I might actually be getting good at dovetails. Mine are far from perfect still, but they’re all half decent and they go a lot faster than they used to. On a couple of these, I made the cuts, cleaned things up visually, and the joint went together without any further fussing. Still a few gaps though, but nothing you could drive a tiny vehicle through. Next up came ploughing the groove for the bottom. Nothing I love more than using my Record 044 (as seen in the last part of this post). 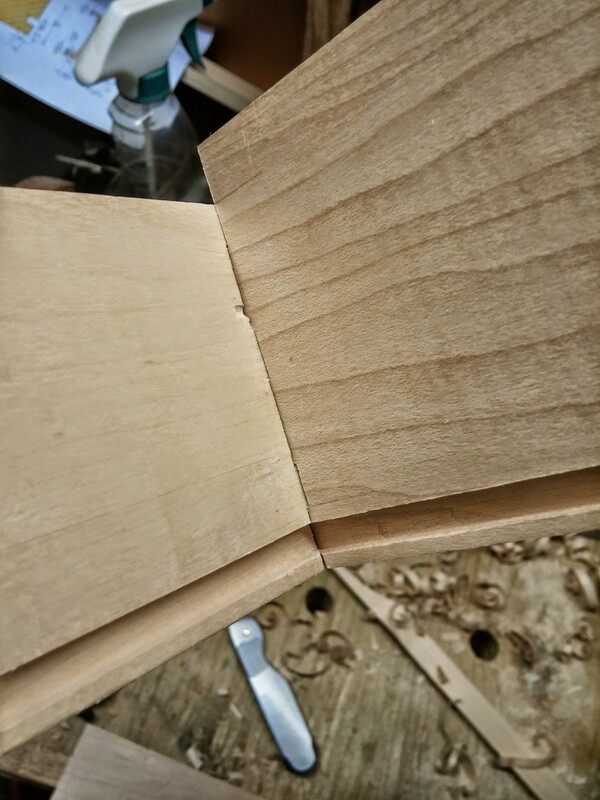 The whole reason for doing the mitered dovetails was to hide this groove. 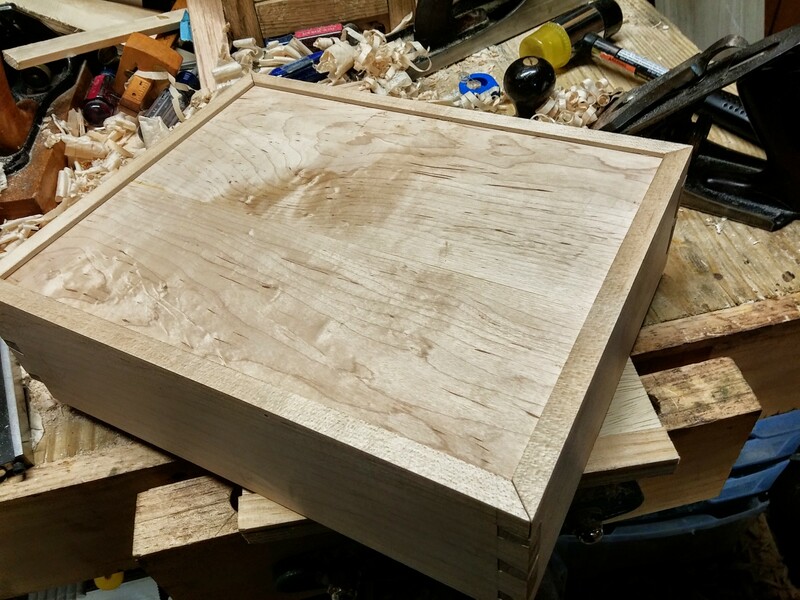 I have some 1/4″ maple to make a bottom panel. So I made a 1/4″ groove. That miter is 1/2″, which gives me 1/8″ on either side of the groove. After grooving all the sides, I put them all back together and all the grooves line up perfectly. I’ll make the bottom panel, and that will fit loosely in there. I hadn’t actually used the 1/4″ cutter from my 044, so it was still in pretty rough, “vintage” shape. So I had to spend a bit of time polishing the back, making a new bevel and honing it. Really only 10-15 minutes though. 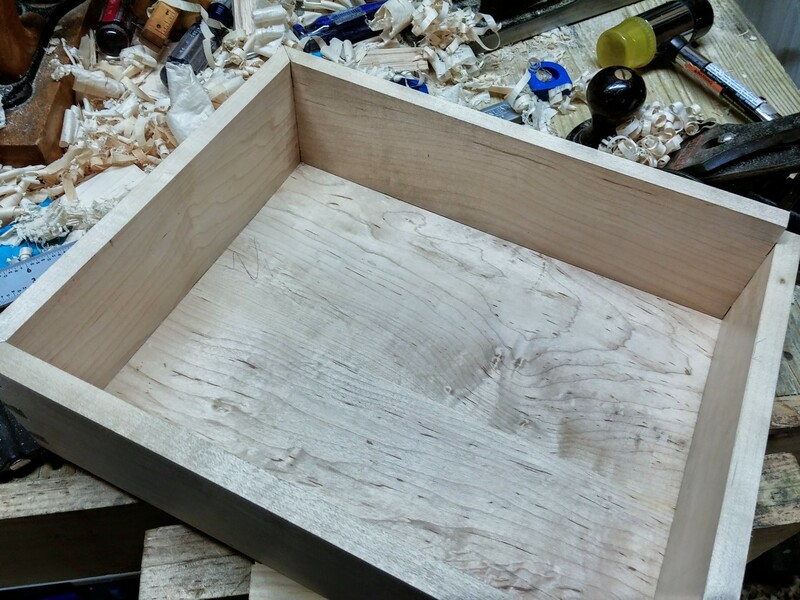 Note that from the outside of the box, you can’t see that groove at all, just the miters. On the front face, I cut the top down by 1/2″. 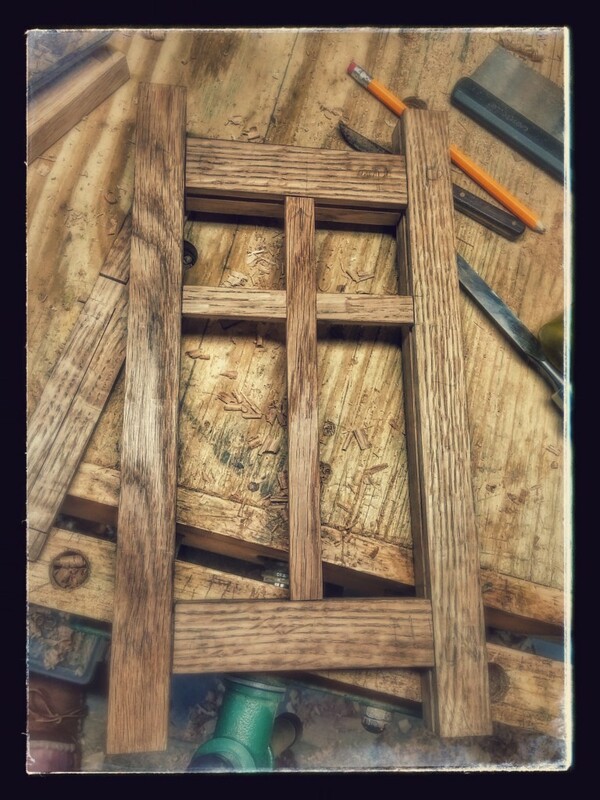 I’ll plough another groove on the two sides at least, for the top panel to slide into. I haven’t decided if I’ll groove the back as well. I’m leaning towards not grooving it though. 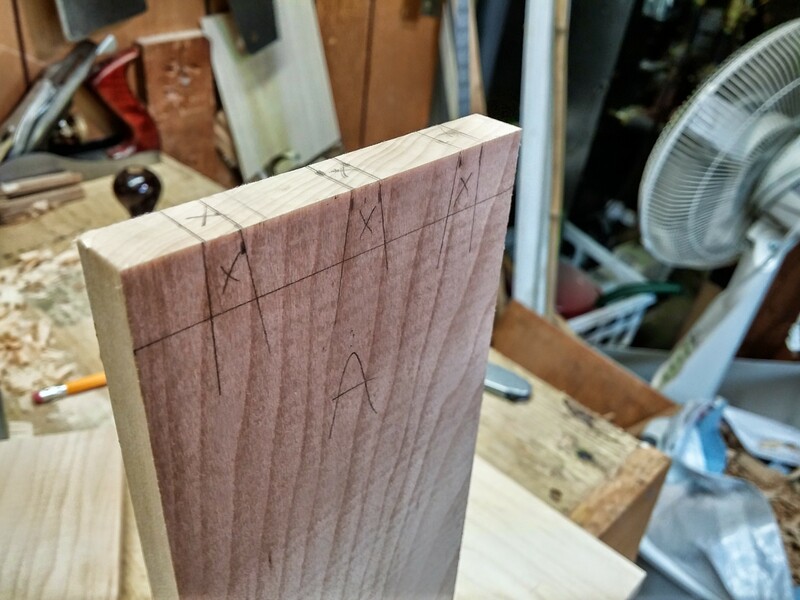 The top will be 1/2″ thick, to be even with the top, so it will need a rabbet on the edge so it will fit in that 1/4″ groove. 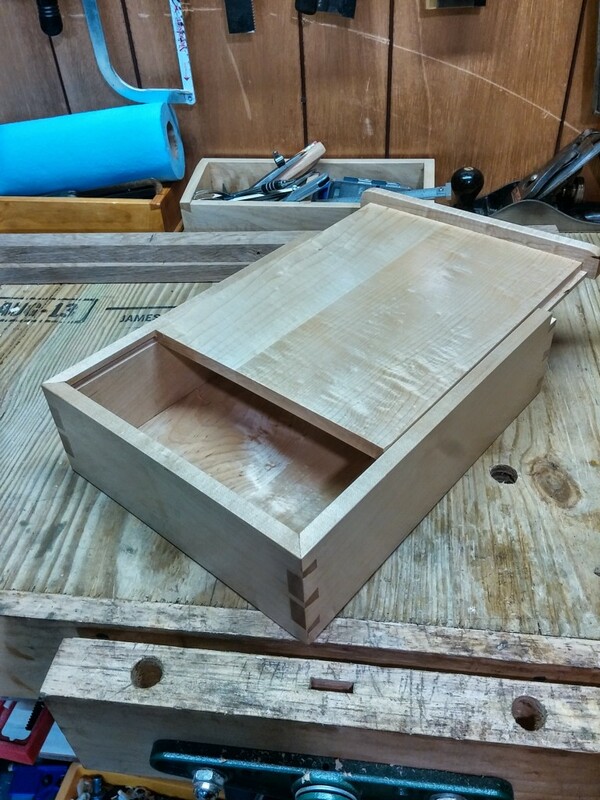 So, next up, grooving the top, making the bottom panel and lid. 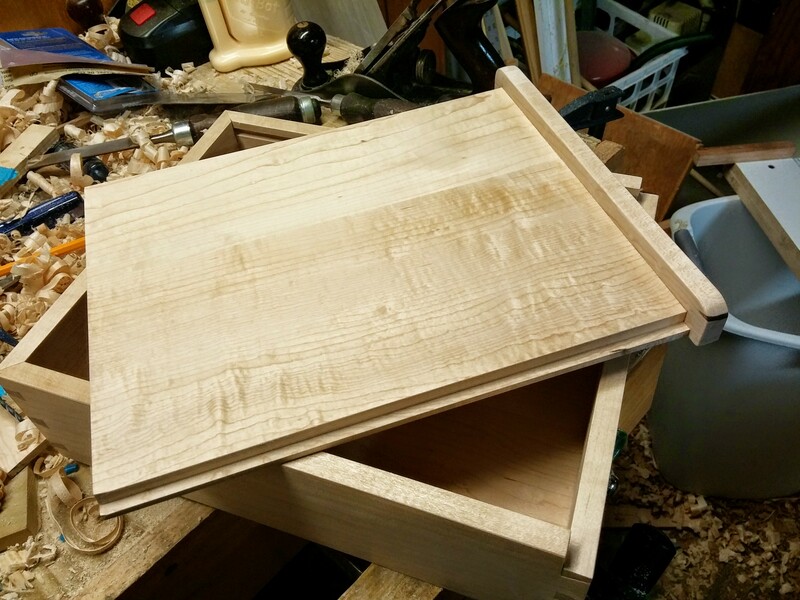 All in all though, the mitered dovetails were way easier than I expected, which is great. I’ll probably do more boxes like this. 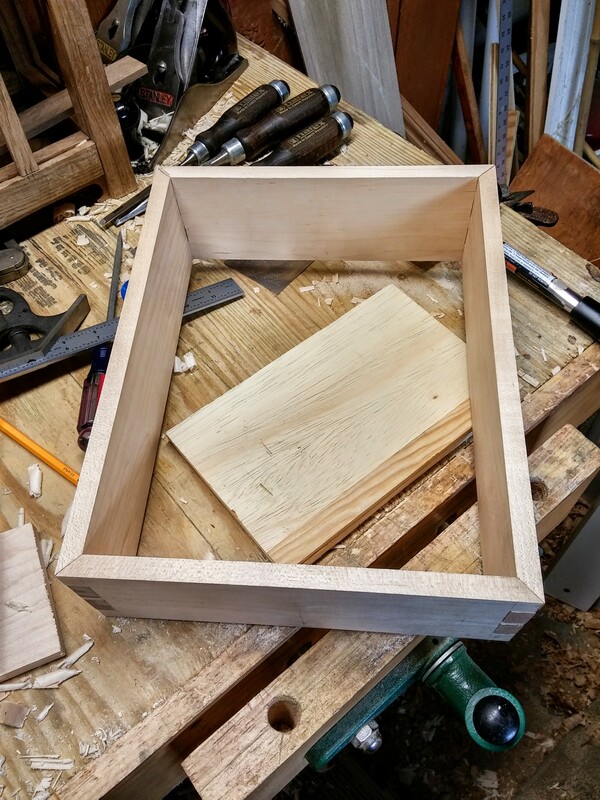 This has been on my mind for a while, so finally made the leap and started a new box. I’m designing this so it will fit 8 1/2″ x 11″ paper. 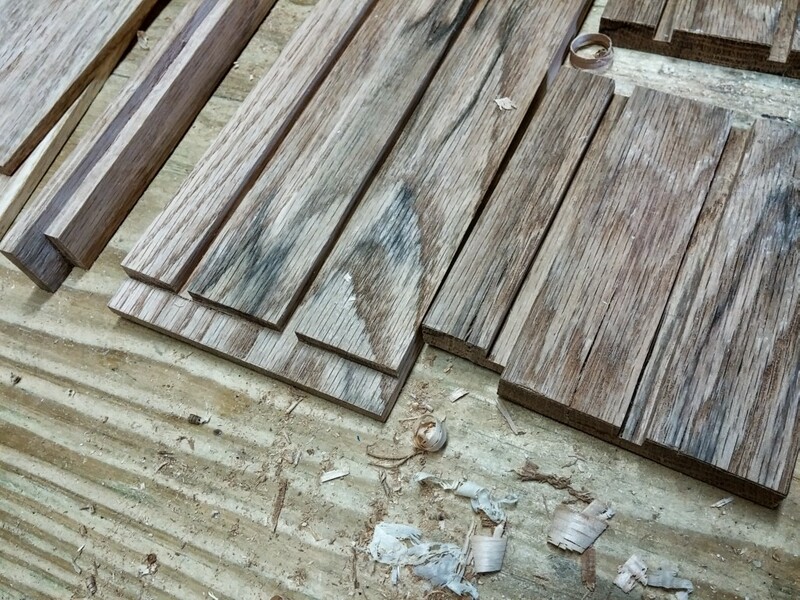 Here are the four sides cut to length. 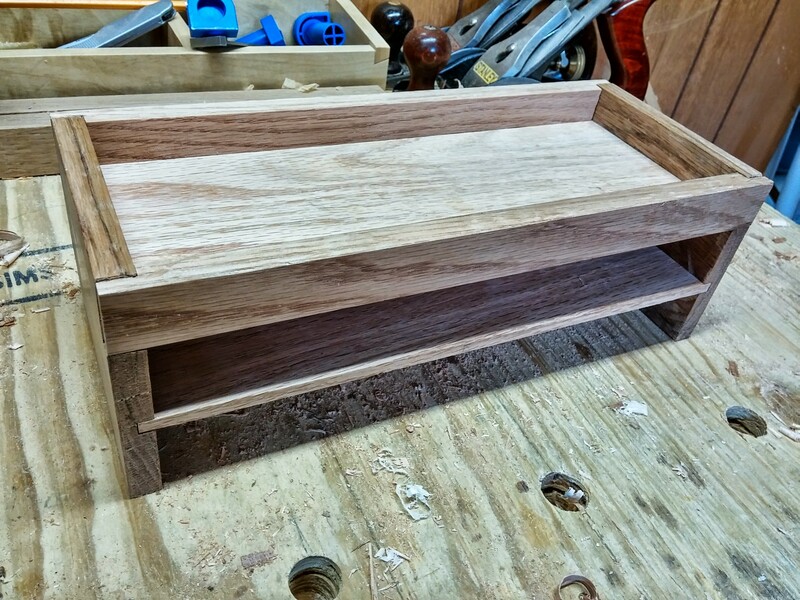 Next, I lay out the dovetails. 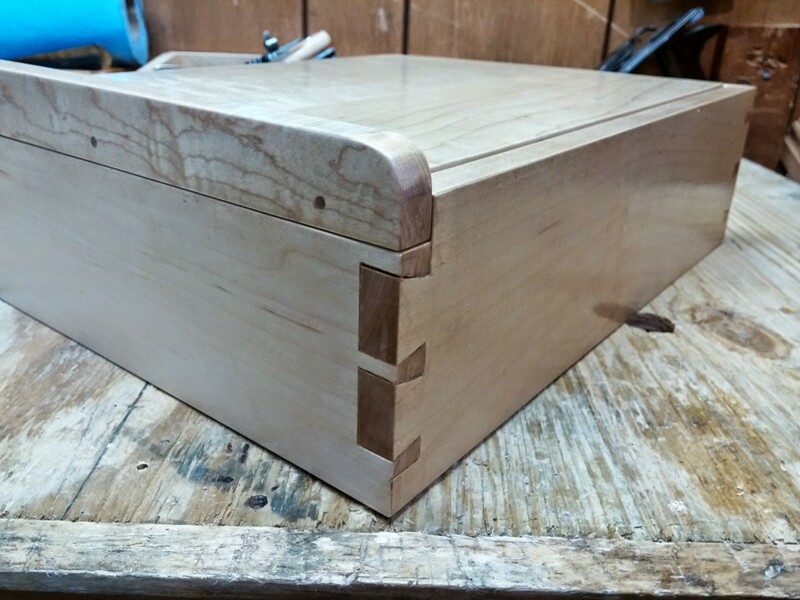 These are a bit different than usual dovetails. 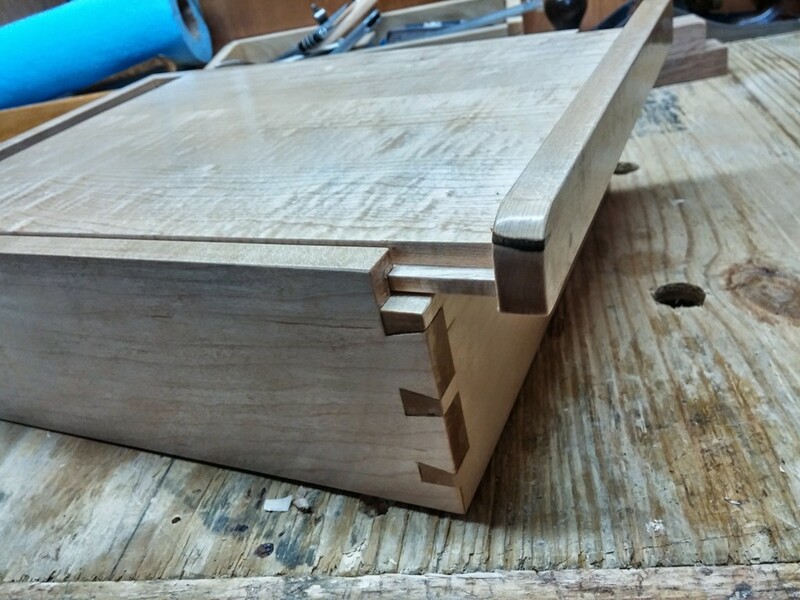 There are two dovetails in the middle of the board and space for three pins, but at each corner, there is an extra half inch. That’s where the miter will be. The pin recesses are cut out, but then those two corner pieces are cut to 45 degrees. This will be the miter. The pins are cut on the other piece, and the corners there are also cut down 45 degrees. 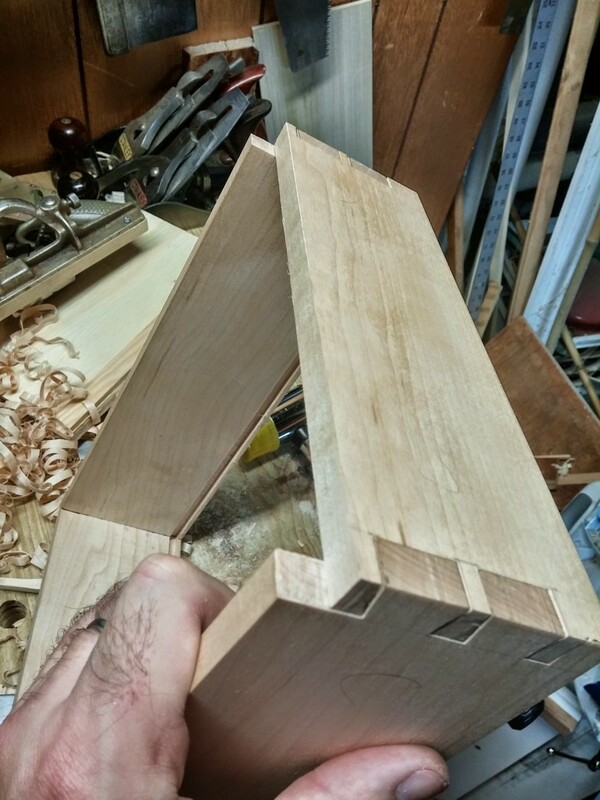 Put these together, and you have a dovetail joint. 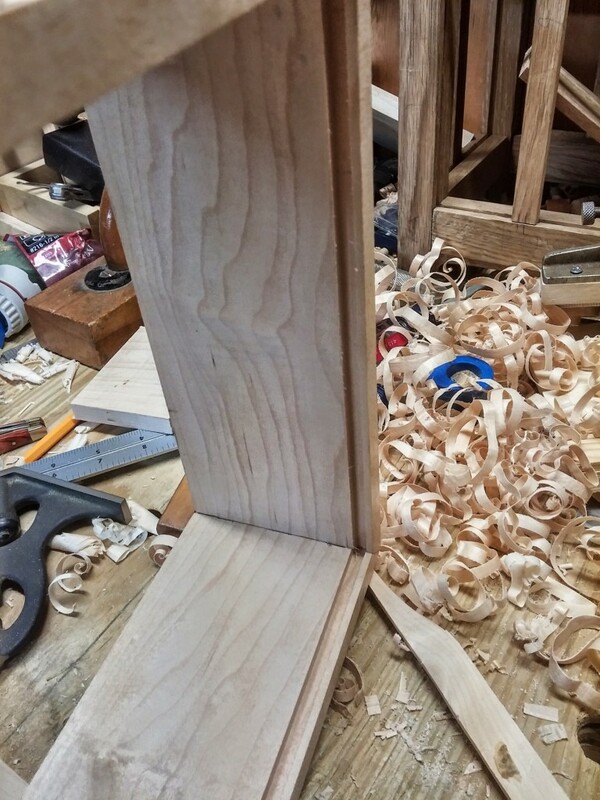 But from the top (and bottom), you have a much more attractive miter joint. 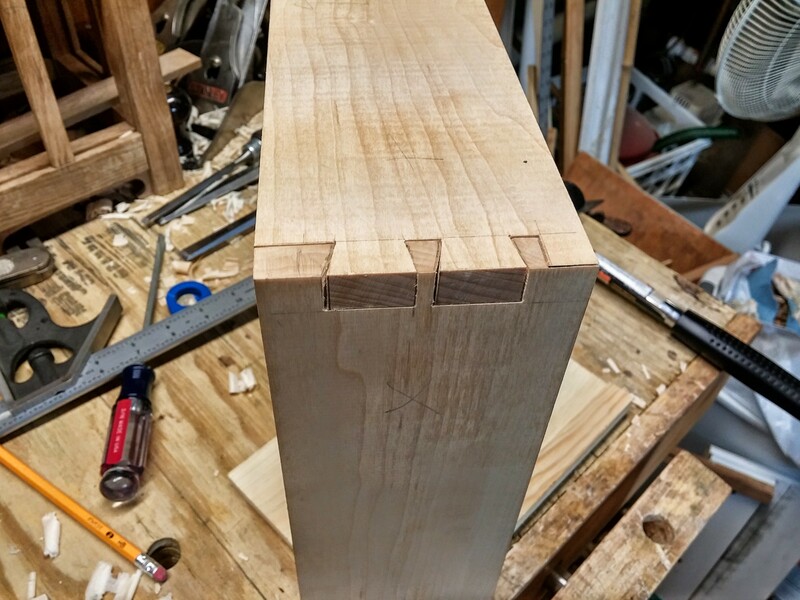 This is a pretty finicky joint to fit. I worked on trimming this for close to an hour and I still need to finesse the miters as they’re causing some gaps. I suppose I’m doing pretty well for my first time attempting this though. 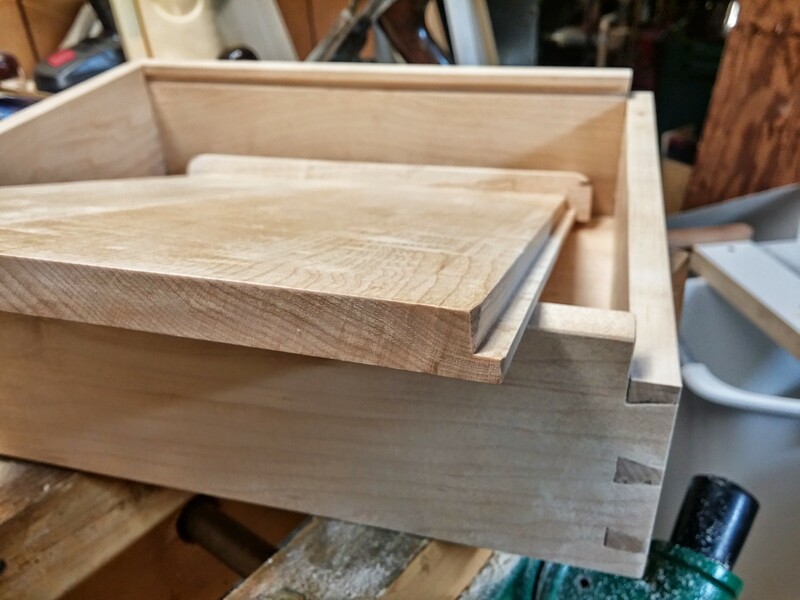 Beyond simply being attractive, the main reason for a mitered dovetail joint is probably so that you can run a groove inside the bottom edge – and maybe top edge too – to install a bottom and a lid. 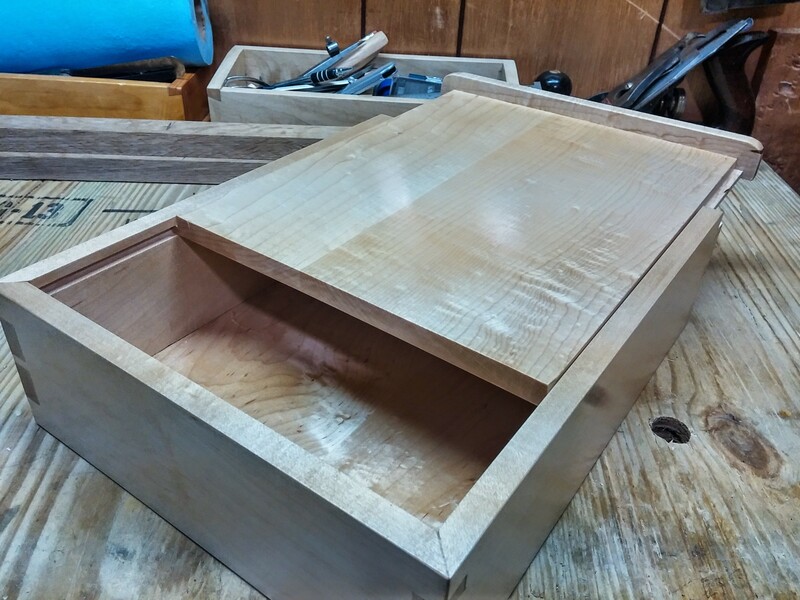 The bottom will fit into that bottom groove and the top will have a sliding lid, fitting into the top groove. 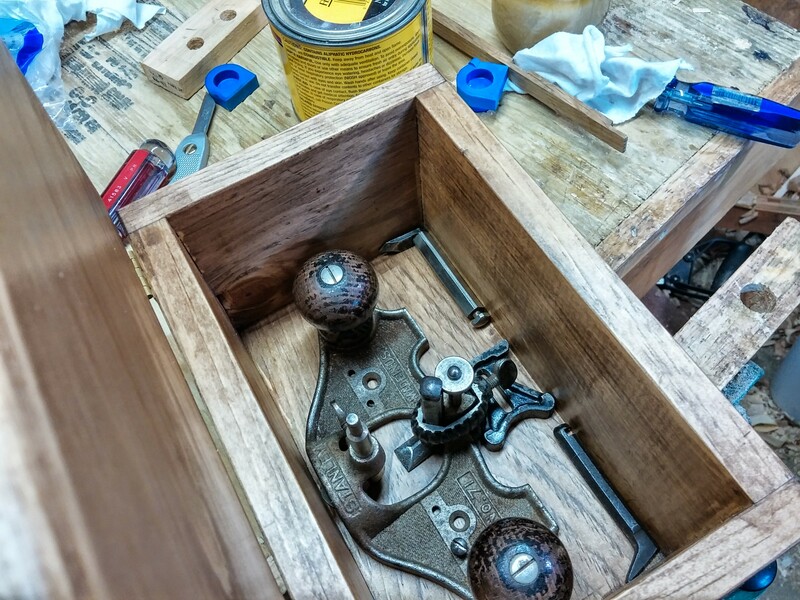 If you run a groove with traditional dovetails, you either need to do a stopped groove, or have the groove pop out through the pins or tails, requiring that you plug it up. 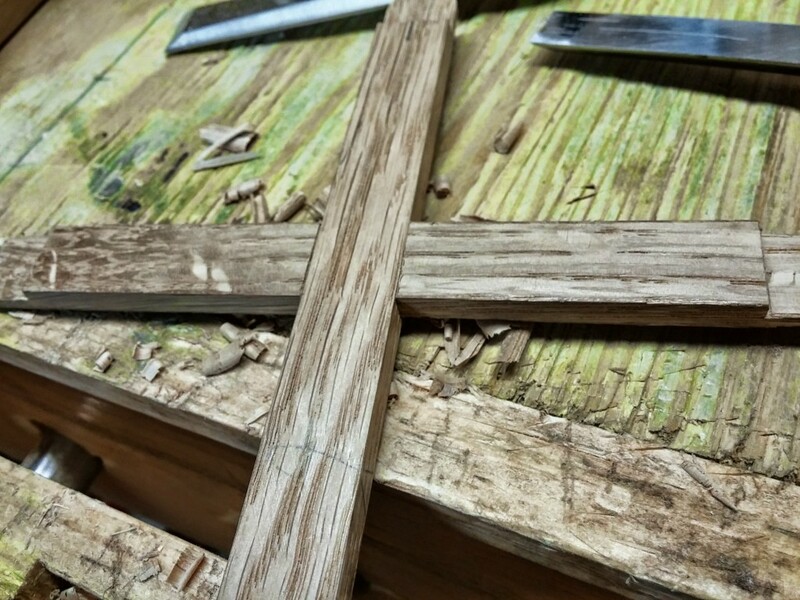 Here, the groove will be totally hidden within the miter. 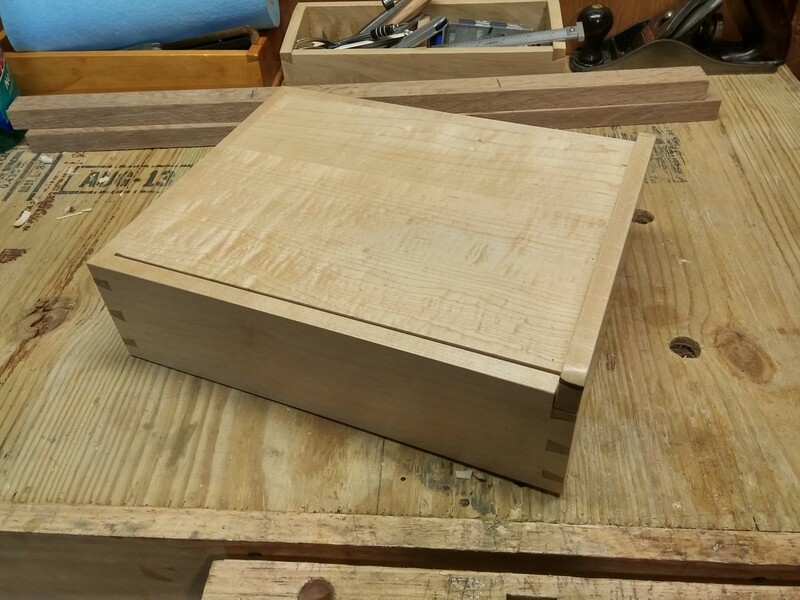 This is also my first time doing dovetails in maple, a much harder wood than the poplar, pine and cedar that I’ve done them in before. 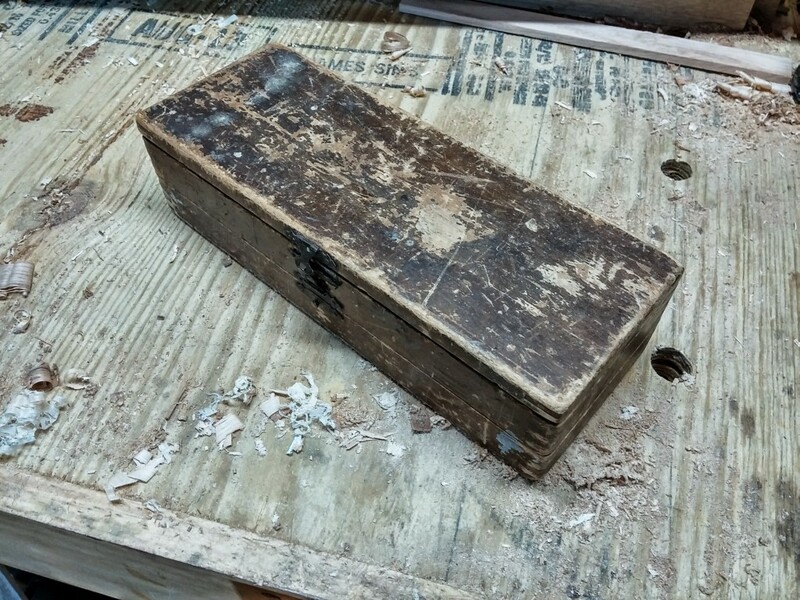 But for the purpose of dovetails, hard is good. Much easier to get nice, crisp lines. The softer woods just crumble and tear and dent all too much. Hopefully without too much more trimming, I can get this corner fitting close to perfectly. Then I have three more corners to do. Never said this was going to be a quick project. 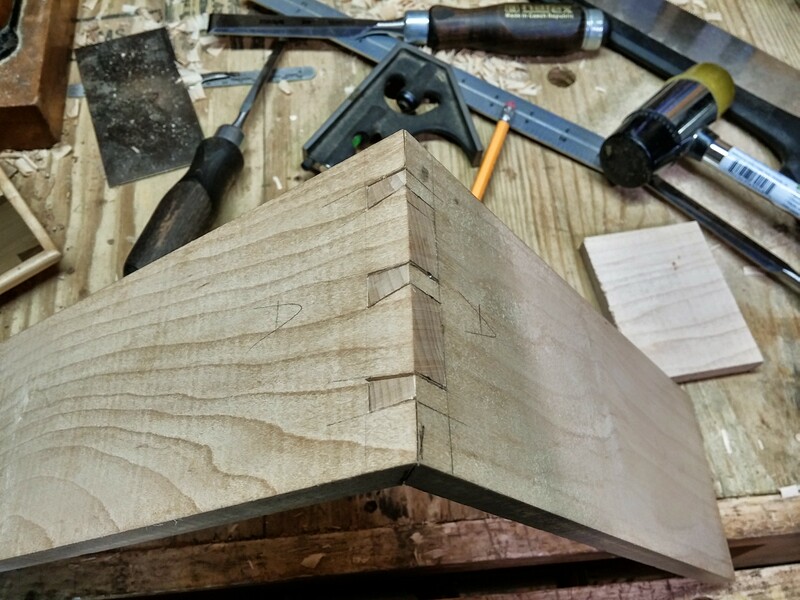 I should mention that I’ve seen two ways of doing mitered dovetails. 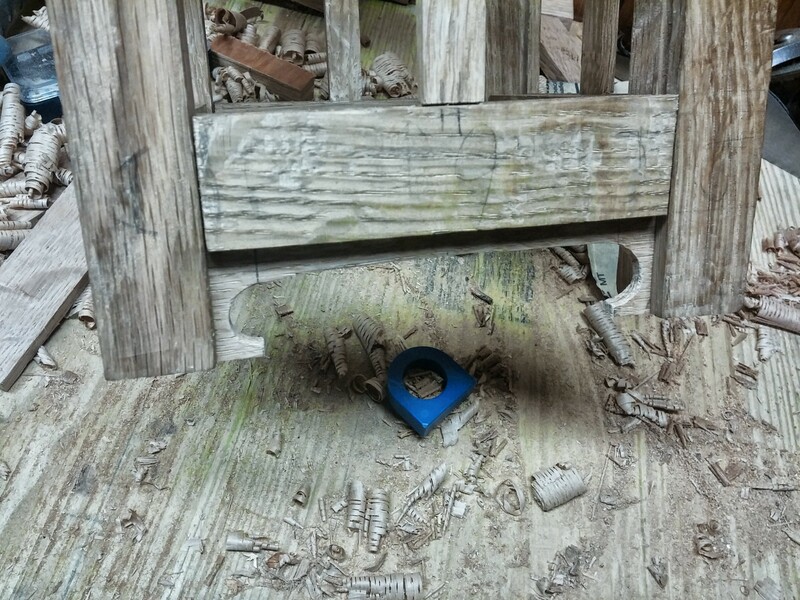 The other way, the final pins themselves are mitered. This is a bit more complex, requiring multiple angled cuts. 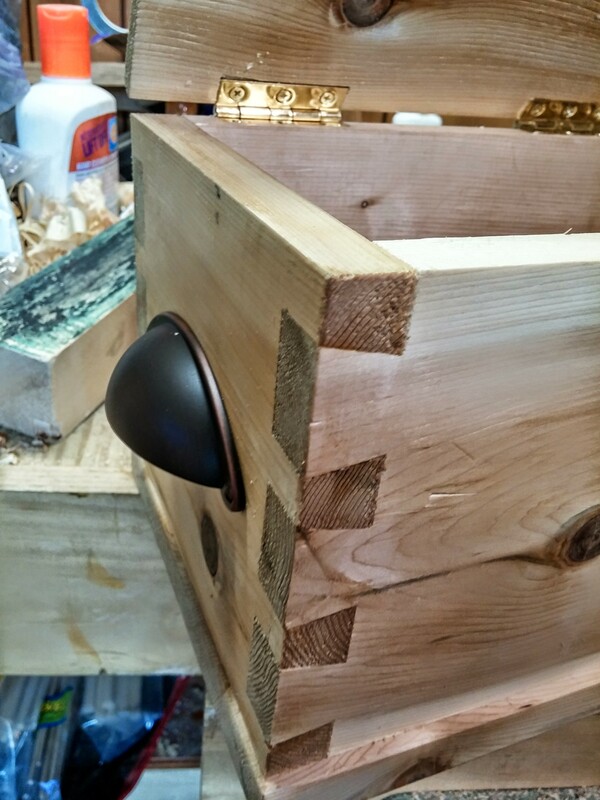 I can’t quite wrap my head around it yet, so for the first on, I opted for this more simple technique – normal pins and tails, surrounded by a miter. Well, I finally got the rest of the glazing bars done. 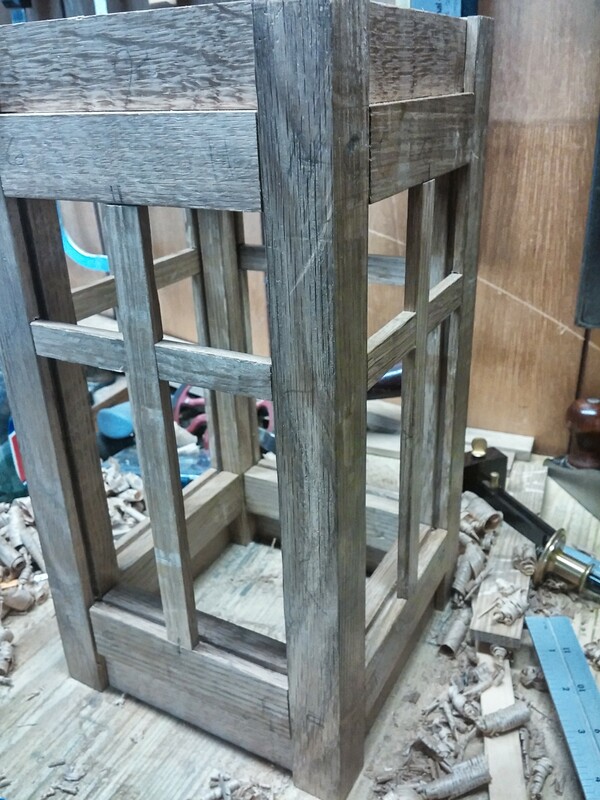 So the frame of the lamp is essentially complete. Next up I need to make the panels for the very top and bottom of each side The top panels will have three holes in them and the bottoms will have a shape cut in them. Here are the pieces for the top. The bottom ones will come out of the board underneath. Here are the top pieces fit into place. 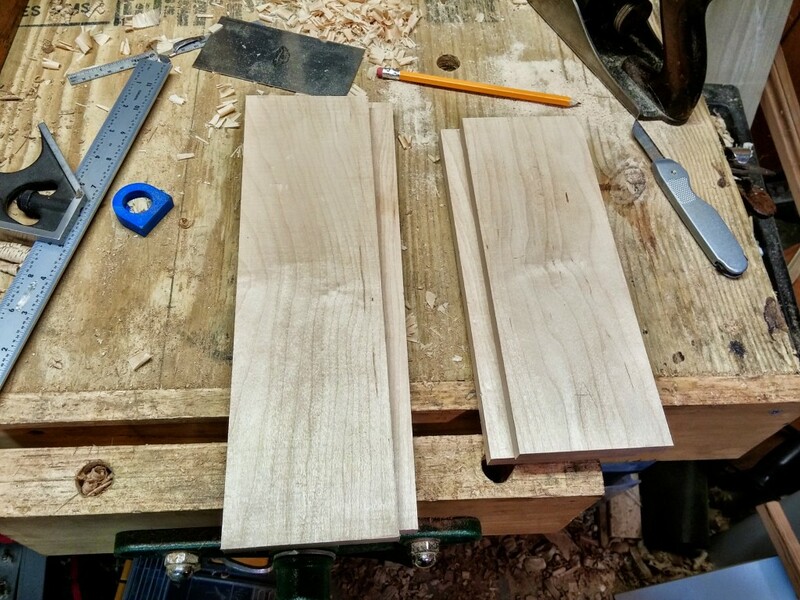 They are thicker than the groove, so I needed to plane down the back on each end. That’s part of the plan, not a mistake. And the holes drilled in the top. They’ll be cleaned up and sanded smooth eventually. 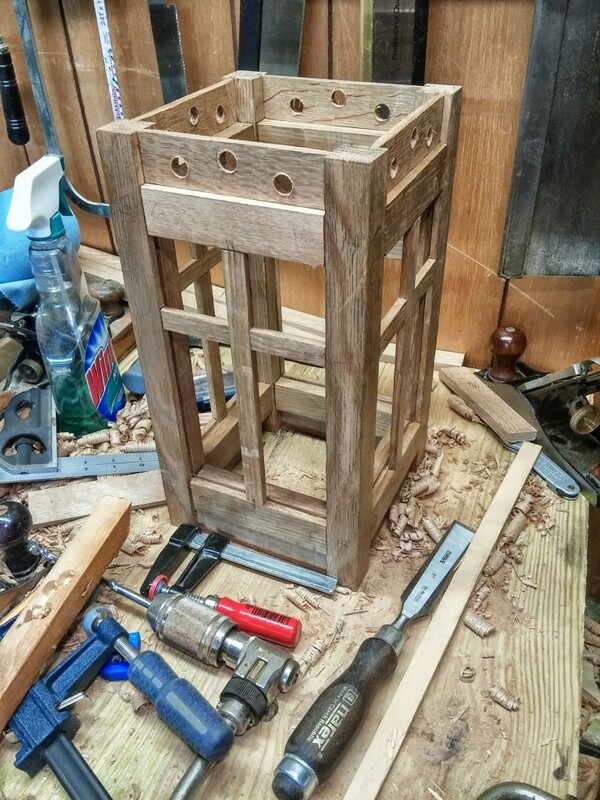 And the whole lamp base with all panels in place. And the bottom panel in detail. I still need to make the top, which shouldn’t be that big of a deal. I’ve ordered some glass which should be in this coming week. I’ll have to cut the glass to size, at which point I can glue the whole thing up, tweaking everything for perfect fit. Then plane and scrape everything smooth. Then attach the top. Then think about finishing. Oh, and put an actual lamp base in it and wire it up. Alternately, it could just hold a candle. At any rate, still lots of work to do on this baby. 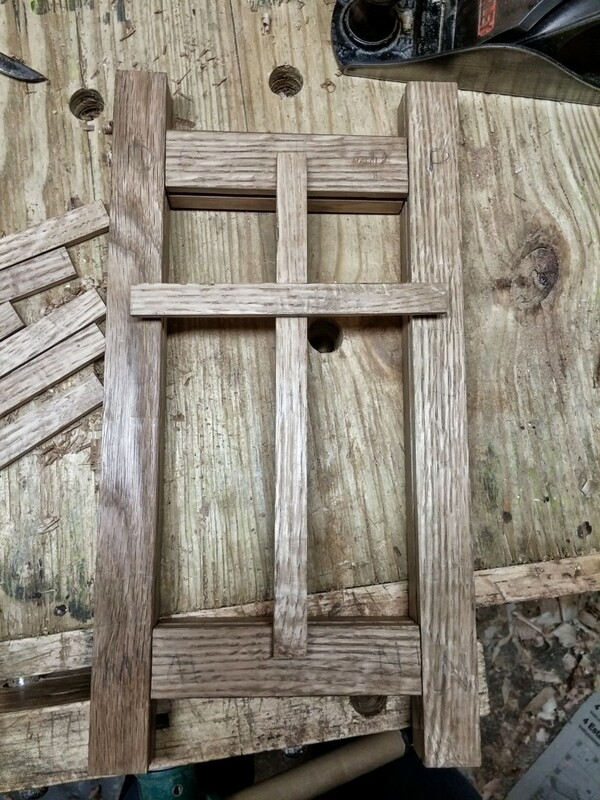 Here’s one of the glazing bars showing the half tenon. 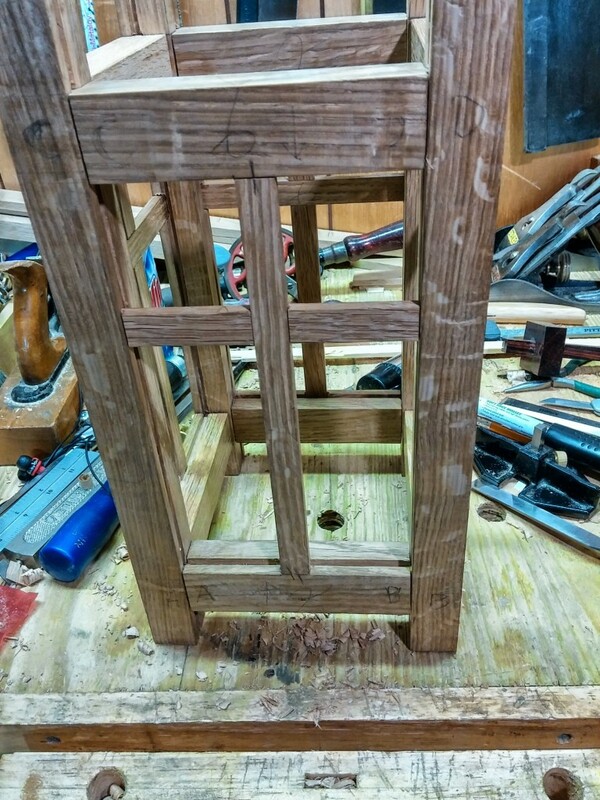 That fits into the mortise and ideally that puts the front of the glazing bar even with the front surface of the lamp. Here’s a glazing bar in place, from the back and from the front. 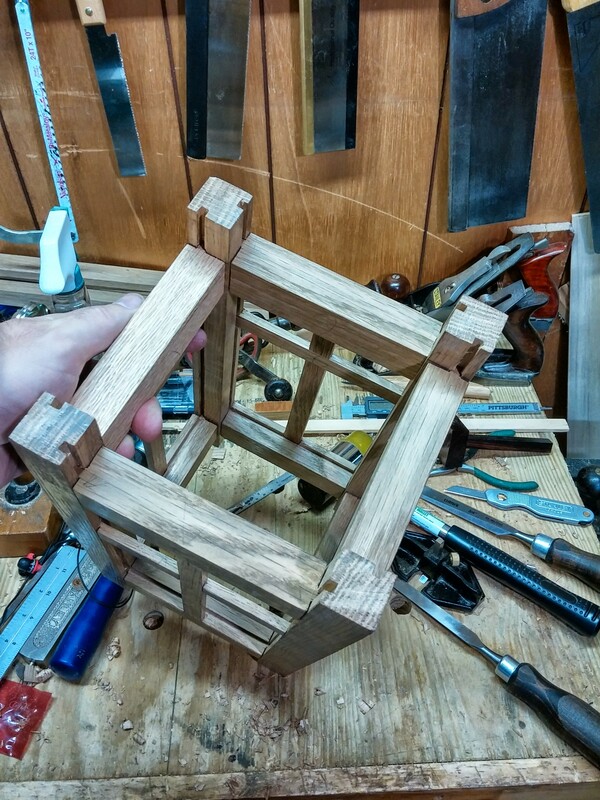 Not perfect, but I’ll be planing everything smooth after glue up, so it should be fairly decent. And here are those half lap joints. Cut out the back half of one piece and the front half of another. They go together just right. I did a pretty good job on these so far. And here we are with two sides in place. Pretty happy with the progress so far. 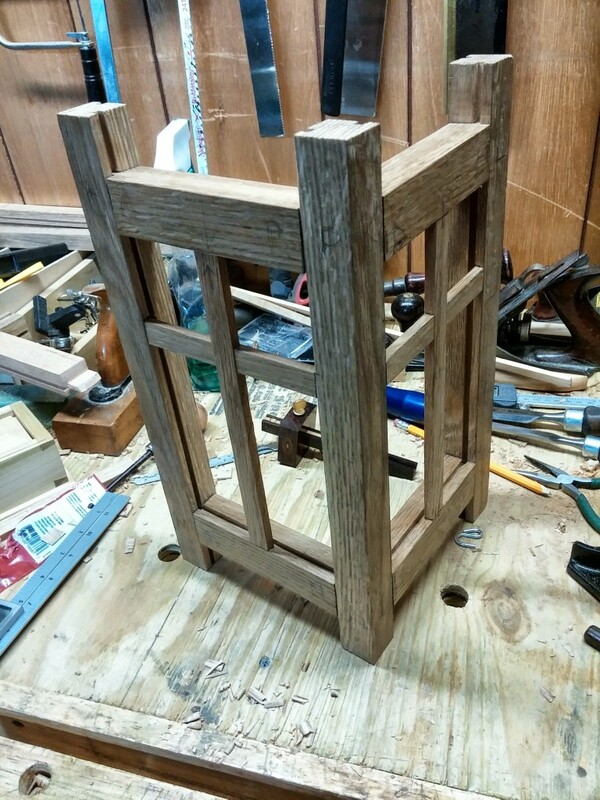 It’s taking me maybe 10-15 minutes to chop each mortise, and then maybe 45 minutes to do all the tenons plus the half lap. So all told, 1 1/2 to 2 hours per set of glazing bars. If I had nothing else to do today, I could wrap this part of the project today. Maybe this weekend. Still lots of work to go after the glazing bars though. Been back to the lamp. 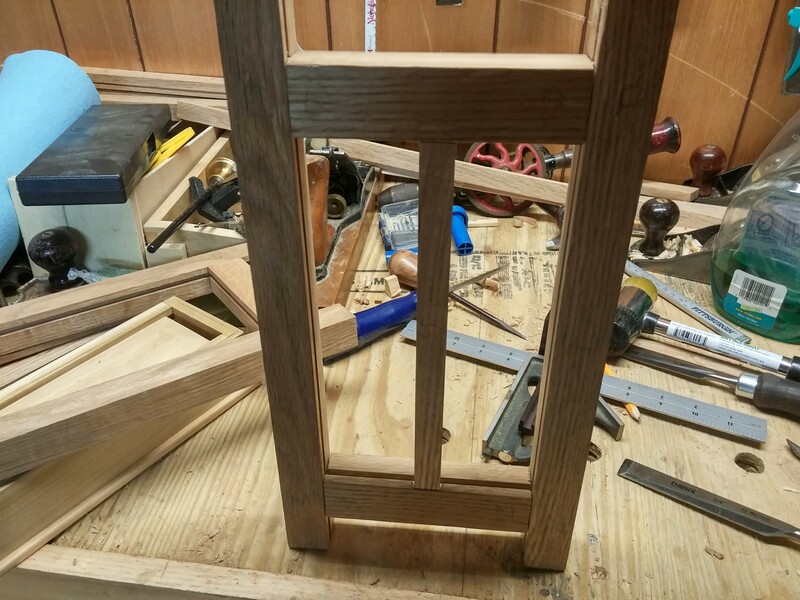 Got some new white oak in to redo the piece I totally messed up. It’s not a perfect match. A bit lighter and smoother grained, but it’ll have to do. 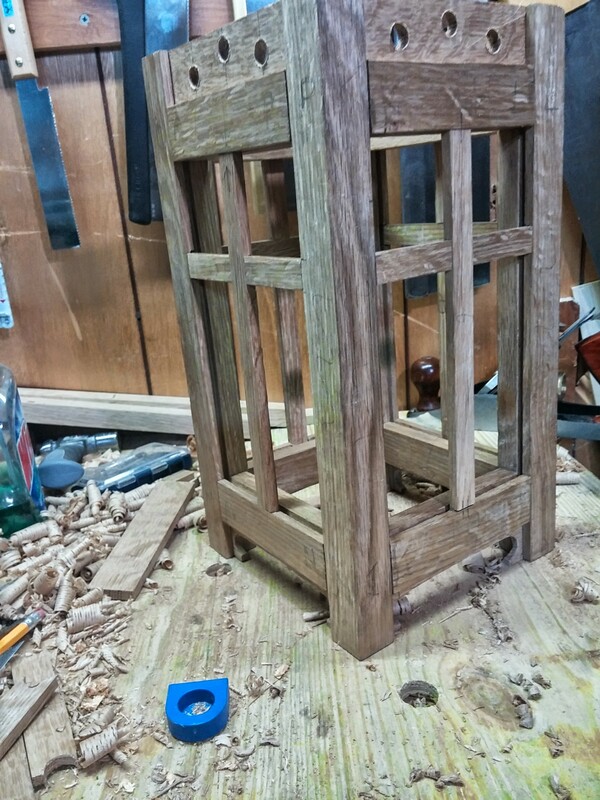 Got that last piece redone and all the mortises and tenons done and now I have the full frame of the lamp done. I spent a bit of time tweaking all 16 of those joints to make sure everything went together as square as possible with no gaps. Here you can see that piece from the new wood, which is quite a bit lighter. I think I’m going to eventually fume this with ammonia to darken it up, so hopefully that will even things out… or not. Next come the glazing bars. Panes of colored glass will go on each of these side, plus one pane on the top. 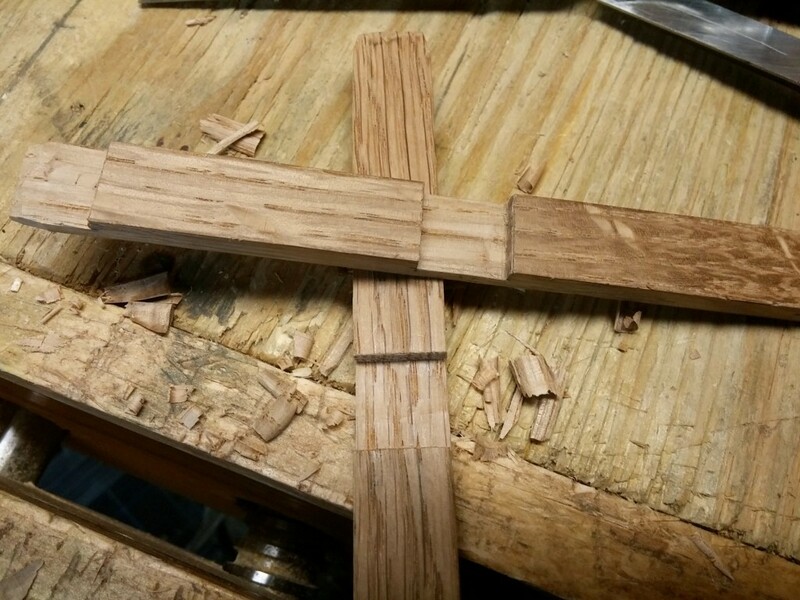 Each of the sides will have a couple of cross pieces forming … a … cross… like cross pieces tend to do. Anyway, I cut those out and planed them down to exact dimensions. One long vertical piece and a shorter horizontal piece per side. Here’s how they’ll be laid out on each side. Now you can see that cross I so lamely tried to describe seconds ago. 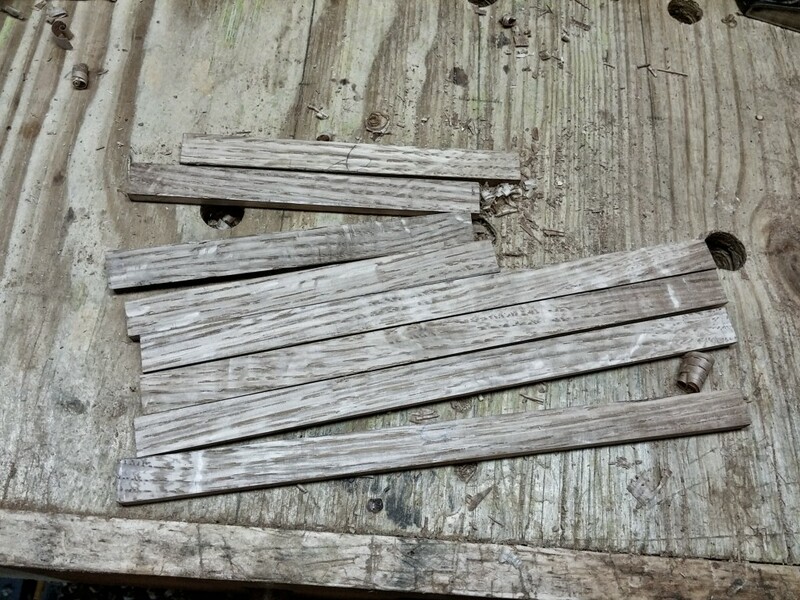 These will be mortise-and-tenoned into the larger bars. 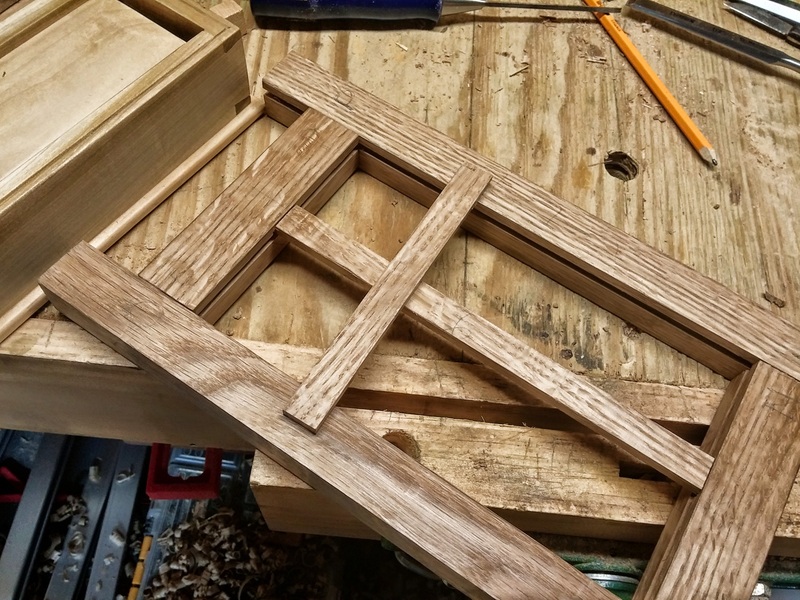 That’s some tricky joinery as those glazing bars are 1/4″ thick. 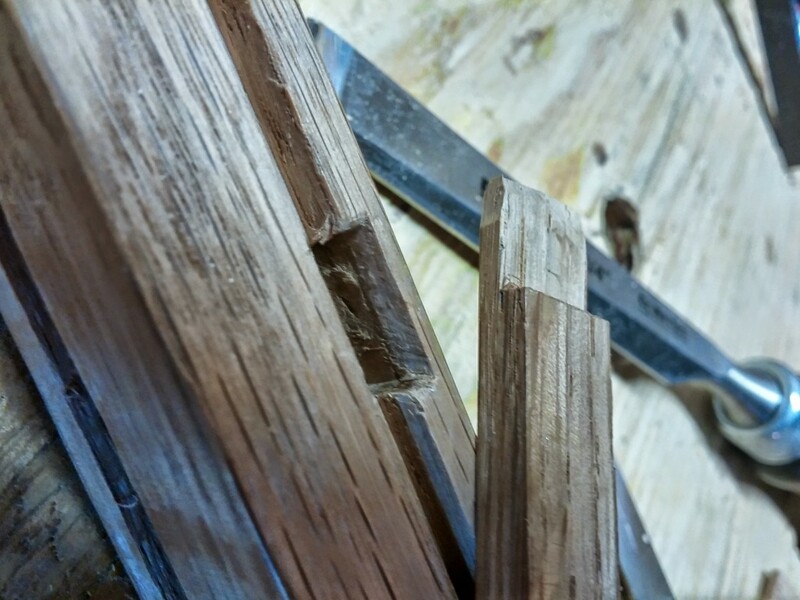 I’ll cut half of that away on each end to make a 1/8″ one-sided tenon, that fits into a 1/8″ mortise. 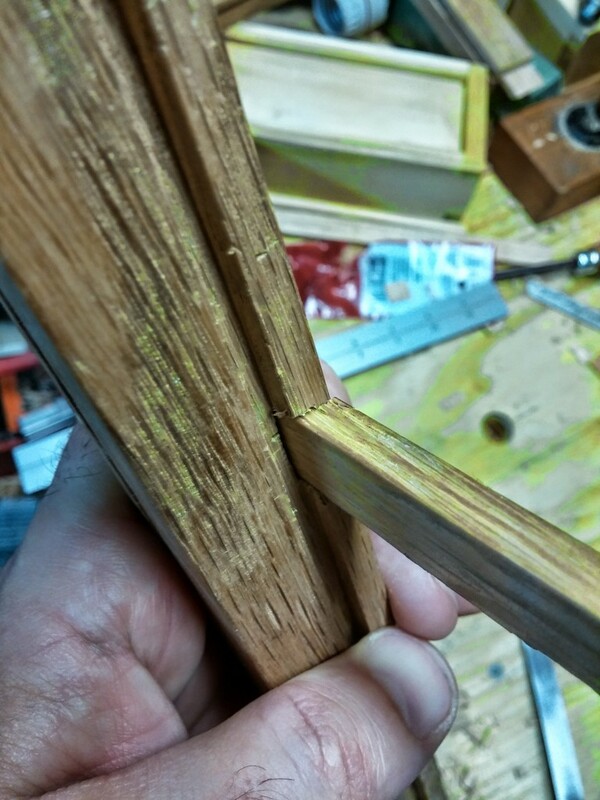 That mortise has to bisect that 1/4″ lip between the outside face and the groove for the glass. 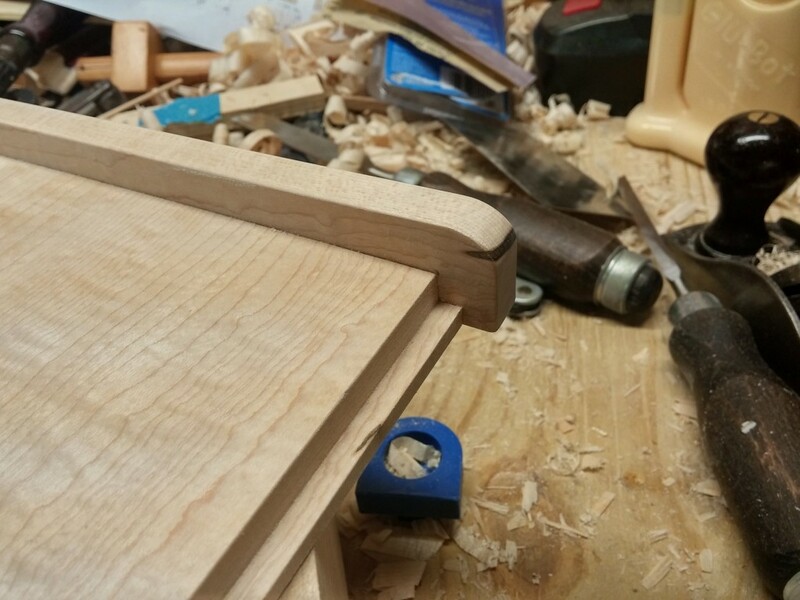 The mortise then continues a bit deeper though, past the bottom of that groove. Hard to describe and I should have taken more pictures, but the result is that the glazing bars are firmly seated in place, and flush with the front surface. Here’s the first vertical bar in place. 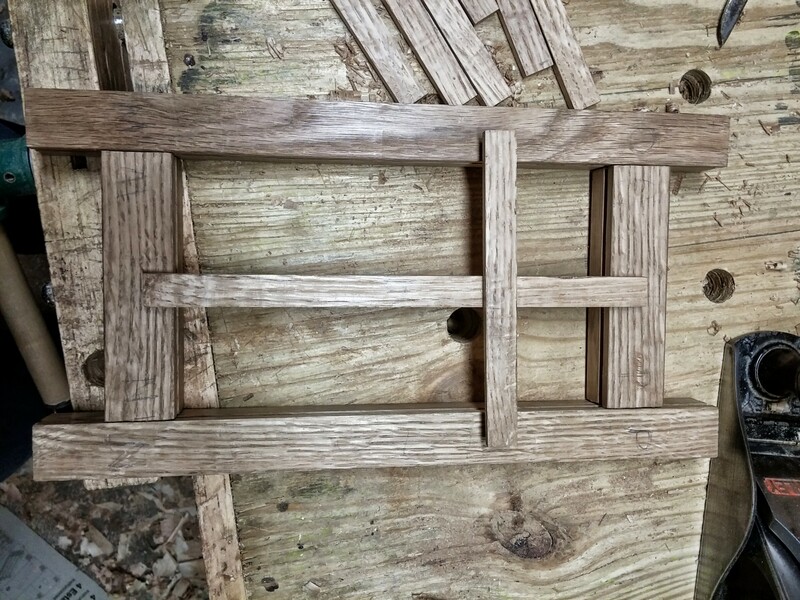 Now I need to cut the horizontal mortice and tenons the same way. Now, you might notice that those two bars will intersect in the middle. 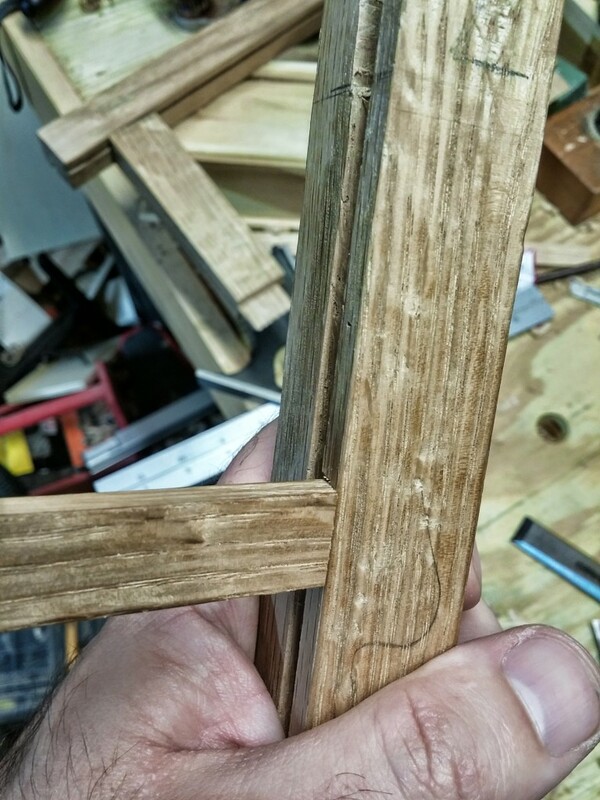 Since they can’t occupy the same space, I need to cut away half of each, in what I think is called a half lap joint. I’ll be cutting the back part of the vertical bar and the front part of the horizontal bar, so that the horizontal bar seems to go behind the vertical. Here’s where I started getting sloppy again. 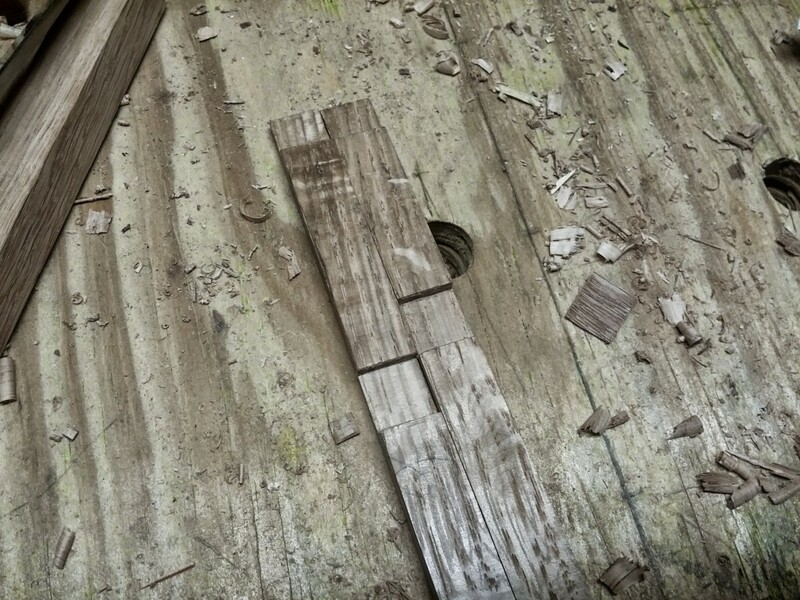 I marked one side of the recess, then marked the other and chopped out half the material in between. But… on the piece on the left, I made the second mark in the wrong direction. Ugh. I was very careful to do the next piece in the correct direction, but then realized that I did both of these on the front face of the vertical bar. This notch should be on the back. So two pieces wasted. 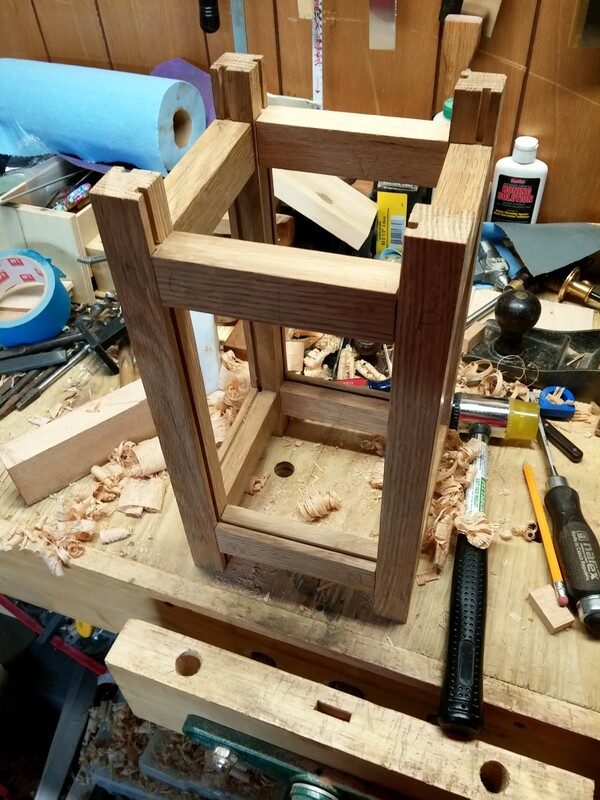 So, made a couple extra vertical pieces and tried again. Got it right this time and then cut the recess correctly on the horizontal piece as well. Google was nice enough to put a stupid fancy border around this image and do some creative blurring. I’m too lazy to get the unedited one and upload it again. So now I have three more faces to do like this. 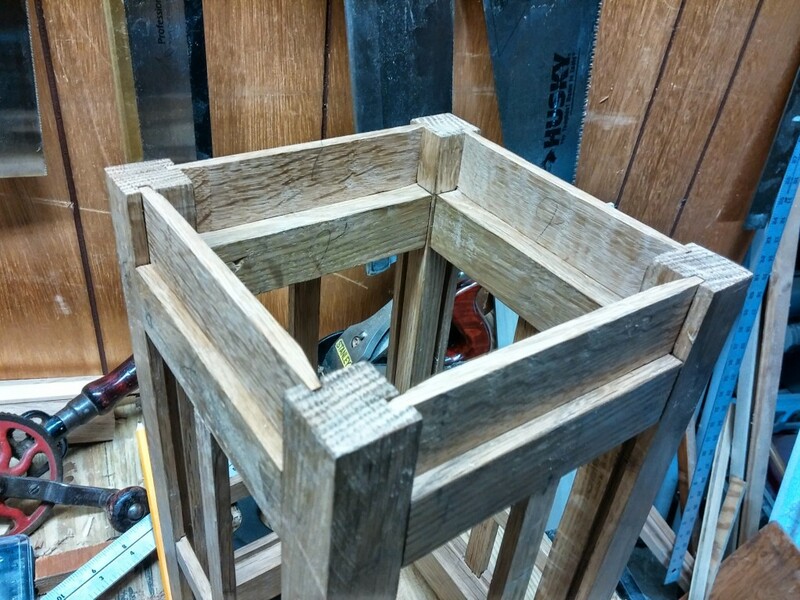 That’s 12 more mortices and tenons, 3 more half lap joints, and hopefully, zero more goofs. 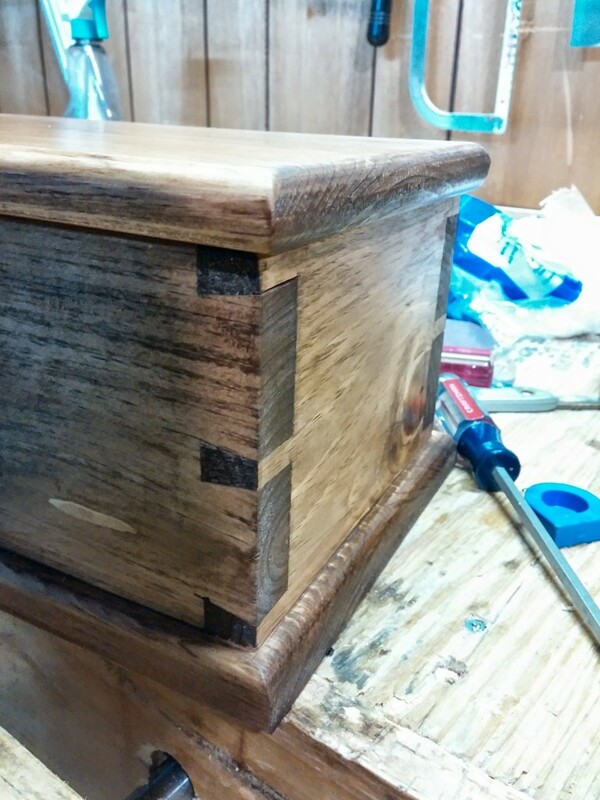 Hey, I think I’m starting to get good at this woodworking stuff. 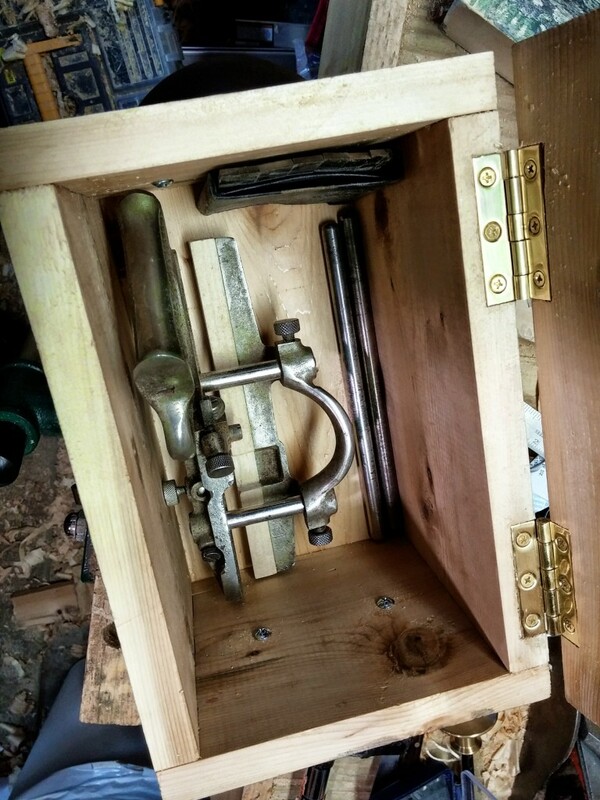 I banged together this box for my Record 044 plough plane in well under 48 hours. And I don’t think I spent any more than 1 1/2 hours on it at any one time. I started on Friday night after work. I’d had a single cedar board hanging around. I bought it some months ago but never had a project in mind for it. 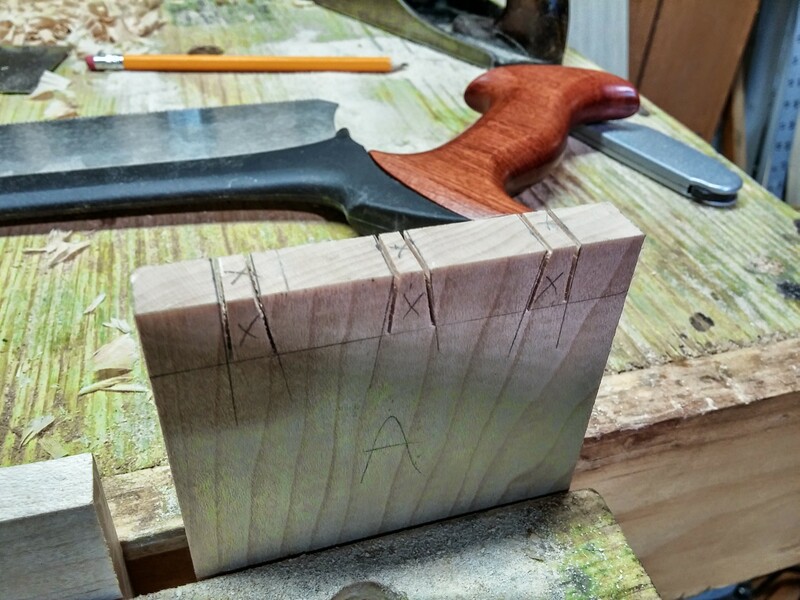 I was itching to try some more dovetails, and my Record 044 is always just hanging out on the bench, threatening to fall off, so I did some quick measurements and started cutting some boards to length. I’ve never worked with cedar before, and I was disheartened at first. The stuff was just crumbling away under my larger saws. It’s seriously almost the consistency of particle board. 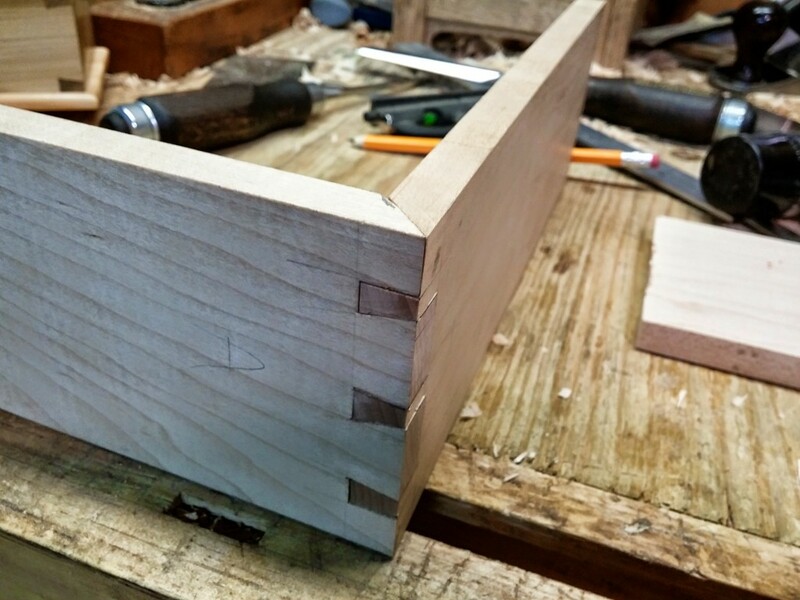 I thought I’d never be able to cut a decent dovetail in this stuff, but gave it a shot anyway. 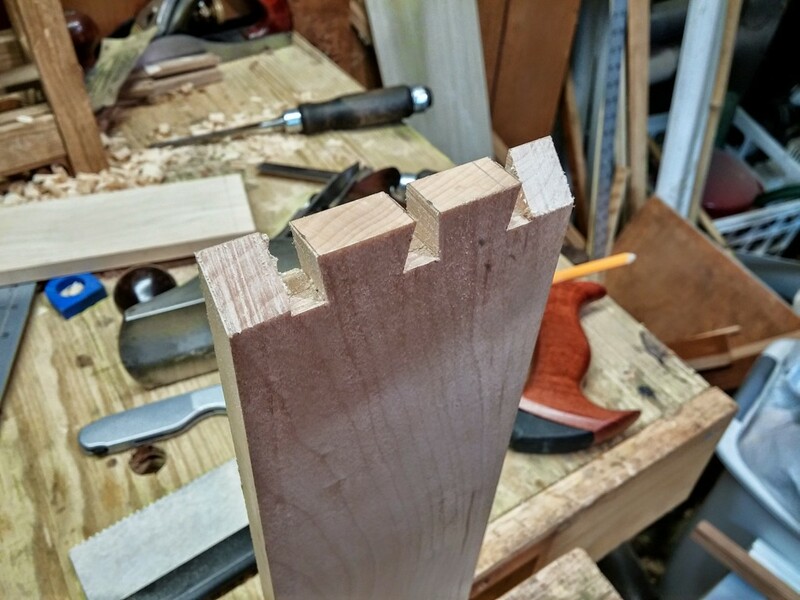 With my 16 tpi Veritas dovetail saw, it actually fared pretty well. 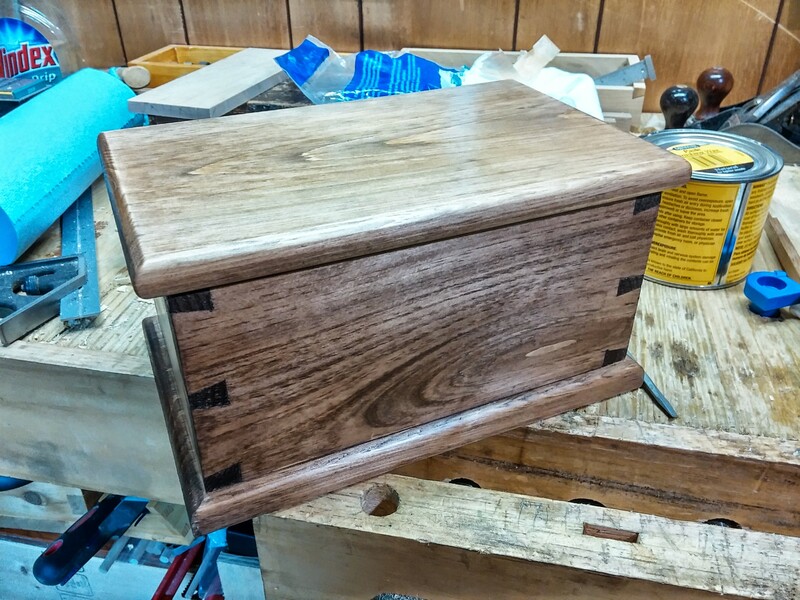 I got one set of dovetails done before the family dragged me out for dinner to celebrate Kris’s graduation from elementary school. Saturday morning I banged out another corner, then walked the dog. I had some other work to do during the day, editing some educational video, but sneaked downstairs a few times while stuff was rendering and got the other two corners done. None of the corners were perfect. Each had one or two gaps that would need filling. But given the material, I felt I did pretty well. While that was gluing up, I started gluing up some panels for the top and bottom. The wood I had was about two inches too narrow, so needed to do the glue up. 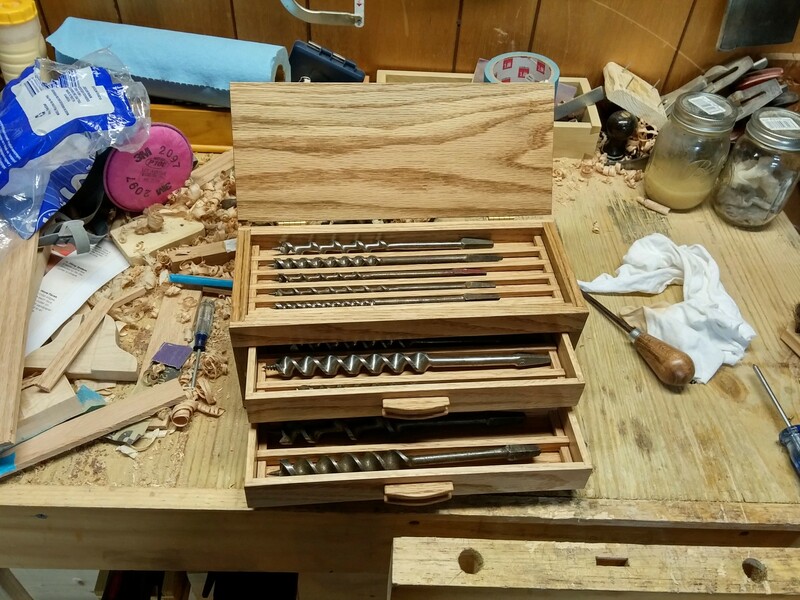 Went out and did some shopping, came back, fixed the gaps in the dovetails and cut and planed the top and bottom and put some roundovers on them. 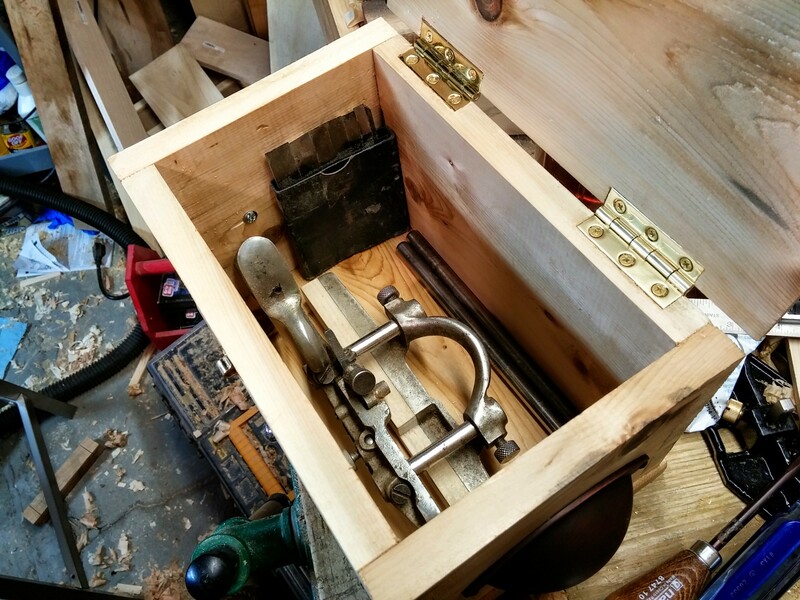 This morning I applied a single coat of tung oil, and this afternoon I picked up some hardware – a couple of cheap hinges, a hook to close it, and some draw pulls repurposed as side handles. Just wrapped up the hardware installation, and called it done. 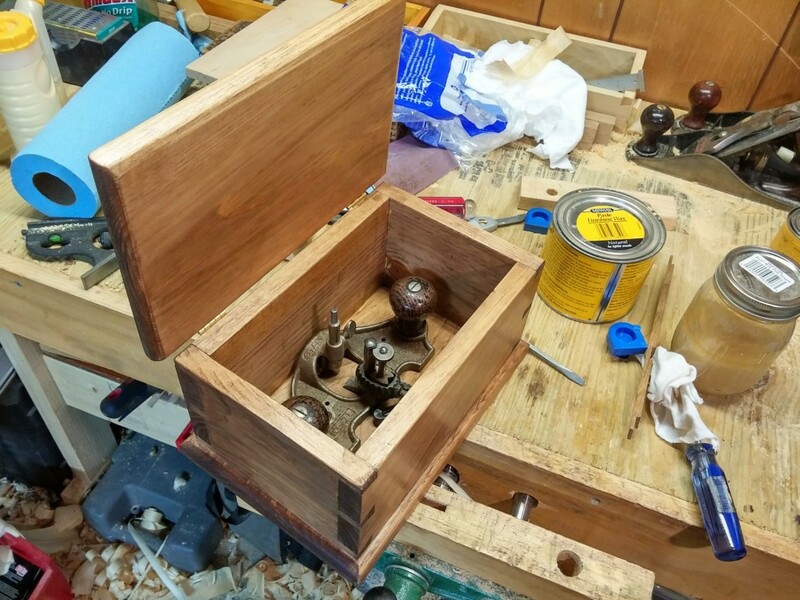 It’s far from perfect, but it was a quickie, designed as a utilitarian shop box to hold an old tool, not a work of art. I’m really happy with it. One thing I learned is that I’ll be in no hurry to use cedar again. 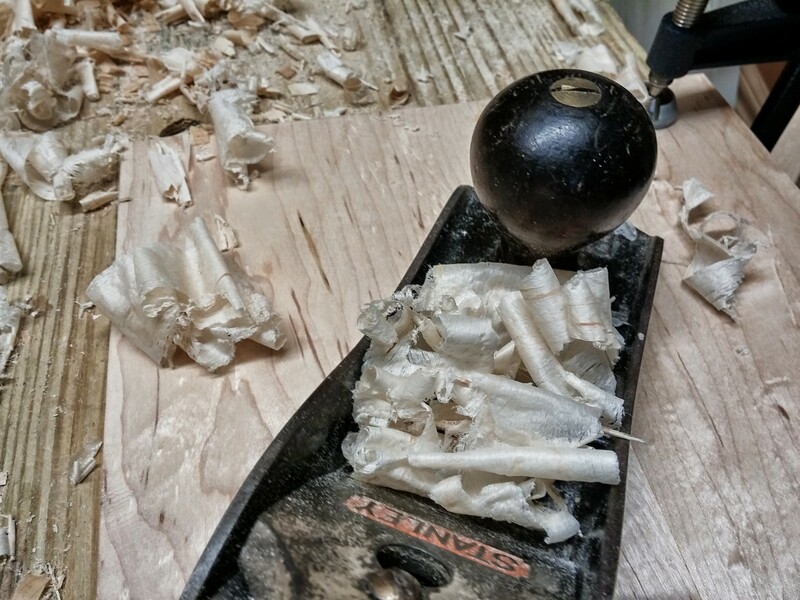 Although it does smell lovely when you’re working with it, it’s like trying to do woodworking with Styrofoam. Not only does it crumble, break and chip out at the slightest provocation, it scratches and dents if you do much more than breathe on it. Huge plane tracks even on the lightest setting. 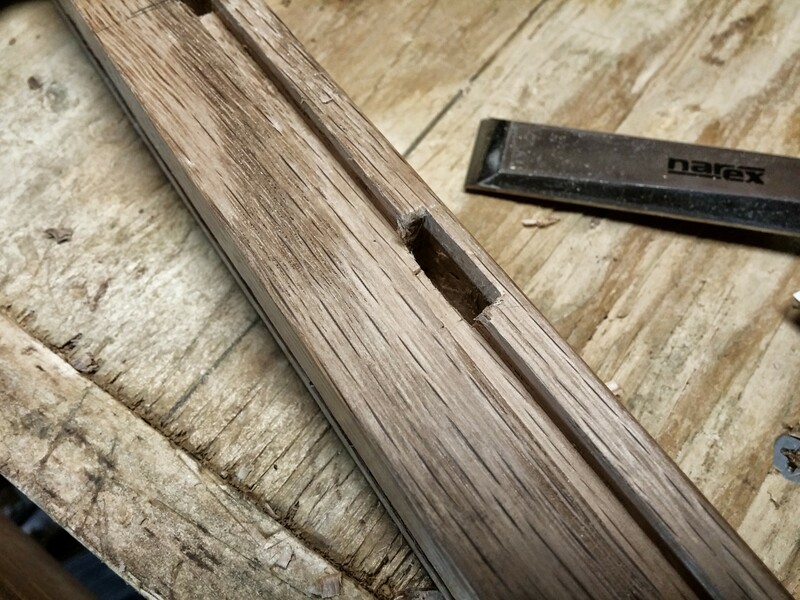 In fact, the plane body itself would score the wood if you pressed down too hard. It was the first project I got to use a card scraper on. Although it didn’t make things perfect, the card scraper was the only way I would have been able to get a half decent surface on anything, so good timing on that. But even the card scraper caused problems. 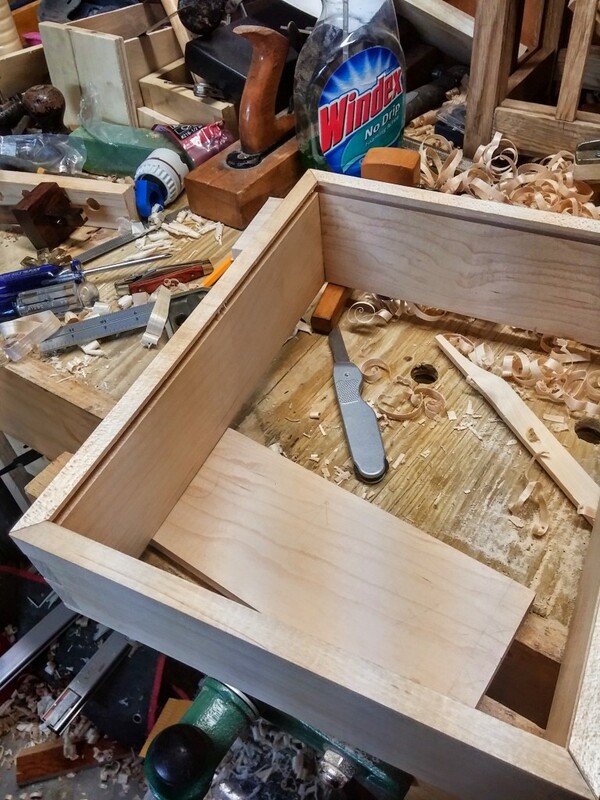 When I was scraping the end grain of the dovetails, any little bits of end grain that broke off would get dragged by the scraper, causing big scratches in the face of the box. Even just the manhandling I did on the box while installing the hardware put a few new dings and scratches in it. But that’s all fine. 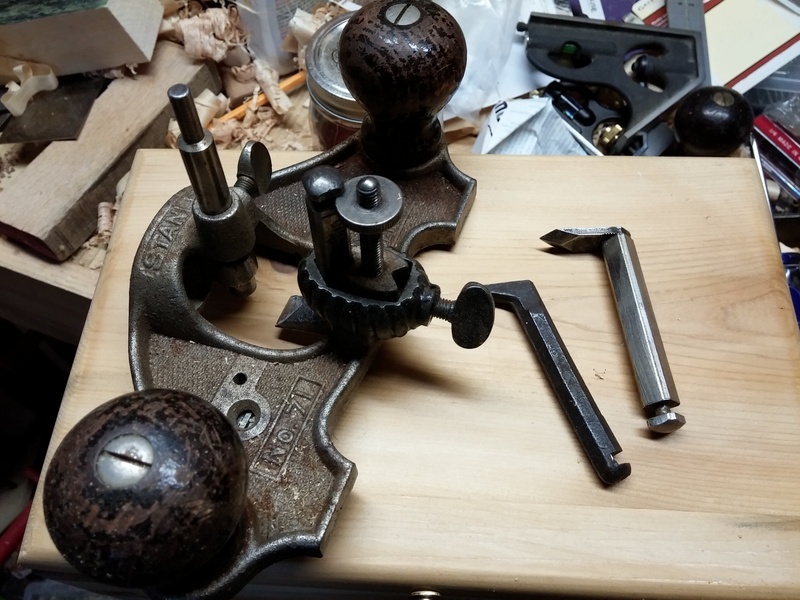 I figure with a few months in the shop, it’ll look like a 100 year old antique. 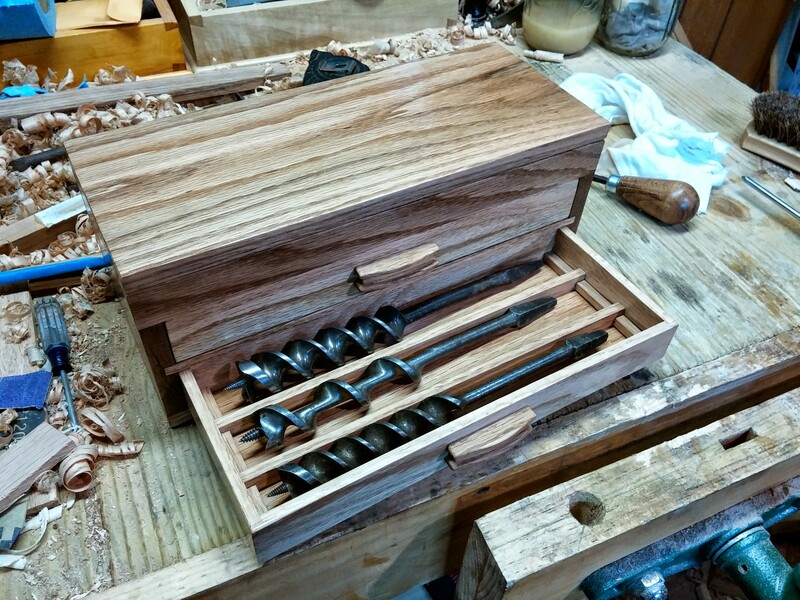 Next up, I think I’ll do a similar box, a bit smaller, for my most recent old tool purchase, a Stanley 71 router plane. It’s got a few extra parts and attachments that need somewhere they can all live together.